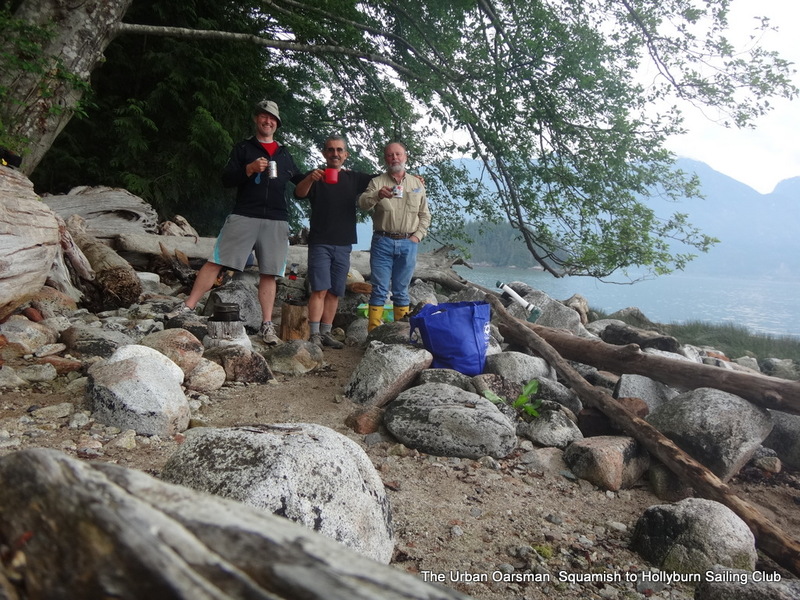 Maciej, Lars and myself at the Squamish boat launch. For every trip, you need to have a trip plan and leave it with someone who can call for help if you are overdue. 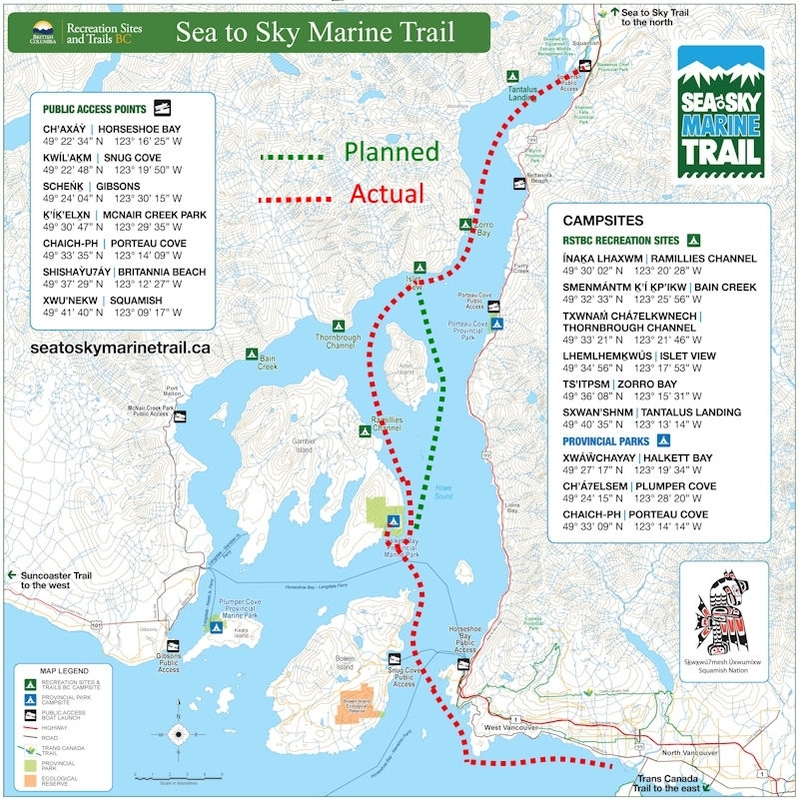 Trip plan showing our planned route and the route we actually took. We leave too early in the morning to pick up Maciej and Lars. I am towing Gwragedd Annwn and have Maciej’s and Lar’s kayaks on the roof racks. 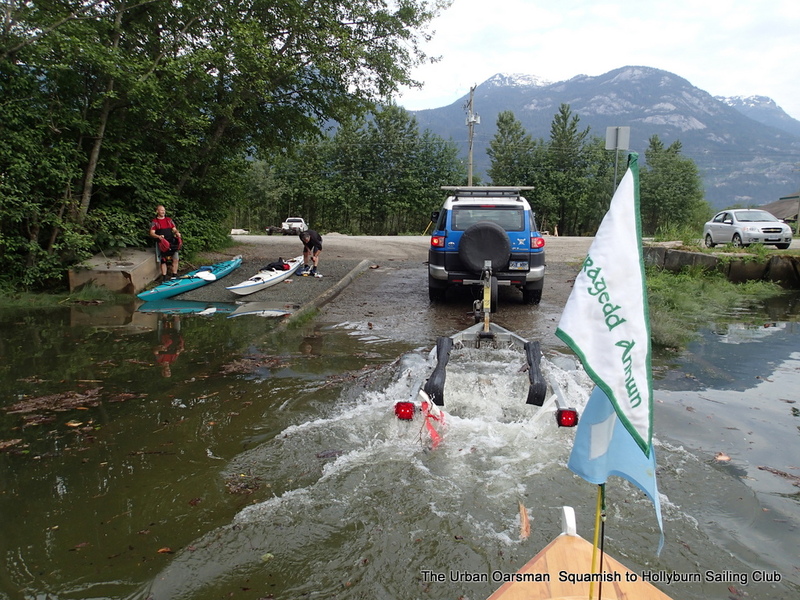 Paul has volunteered to drive the FJ home from Squamish. 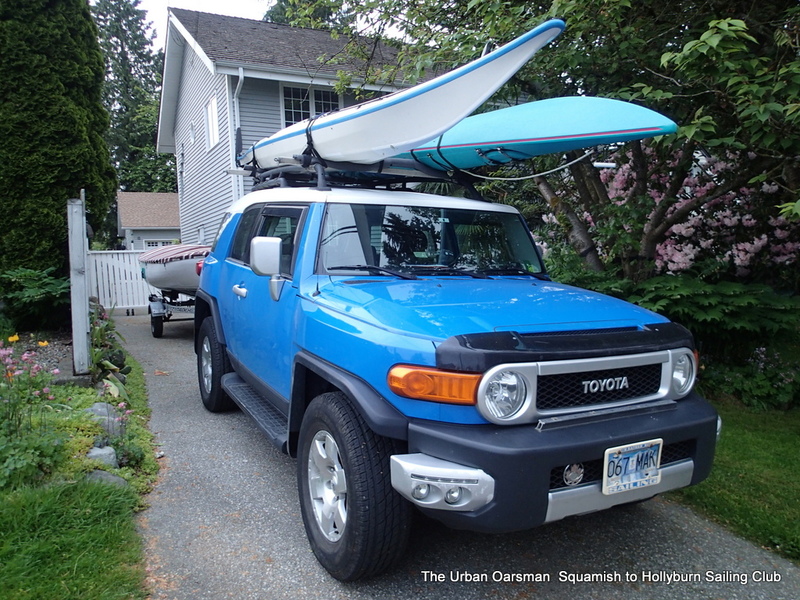 FJ loaded and ready to drive to Squamish…4:56am! 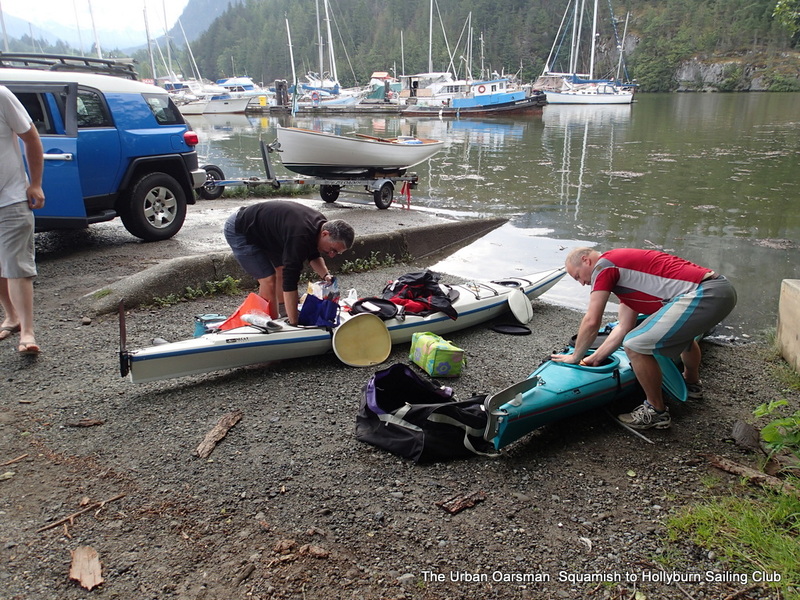 When we get to the Squamish boat launch, Maciej and Lars load up their kayaks. 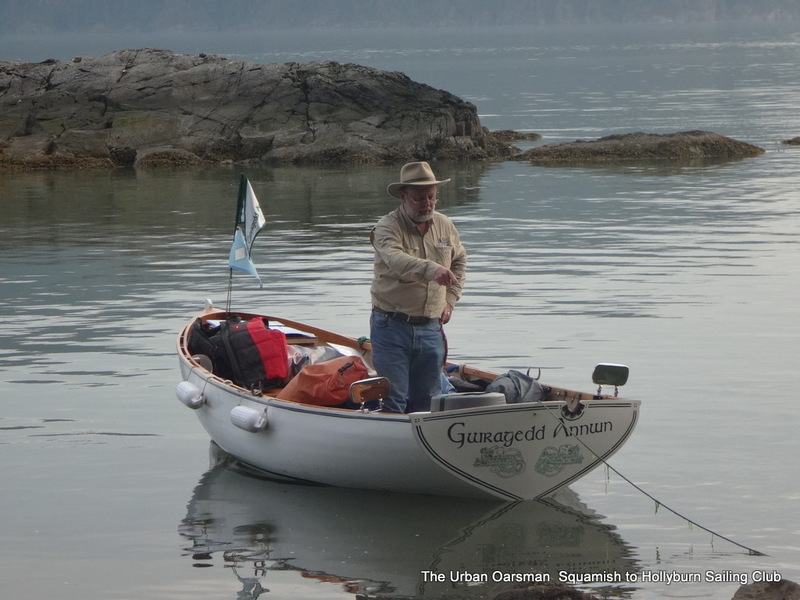 Gwragedd Annwn is already loaded and ready to launch. 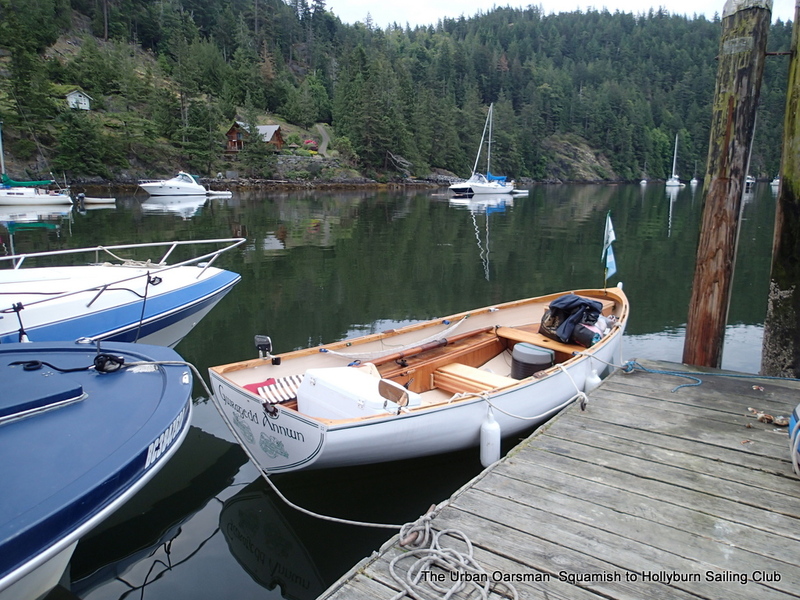 This will be a “test” cruise to see how well Gwragedd Annwn works on longer trips. I get in Gwragedd Annwn and Paul launches me. Paul says a final “good-bye” and heads back home. Lars and I head out, Maciej says he will be along shortly. 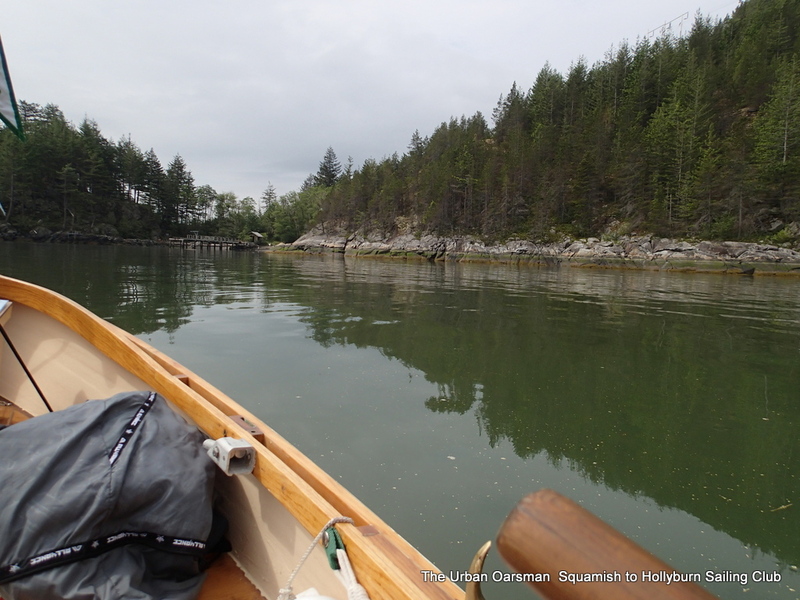 We paddle out of the Mamquam Blind Channel. Conditions are very good. An outgoing tide and no wind. The “Cheetahs” of the sea. 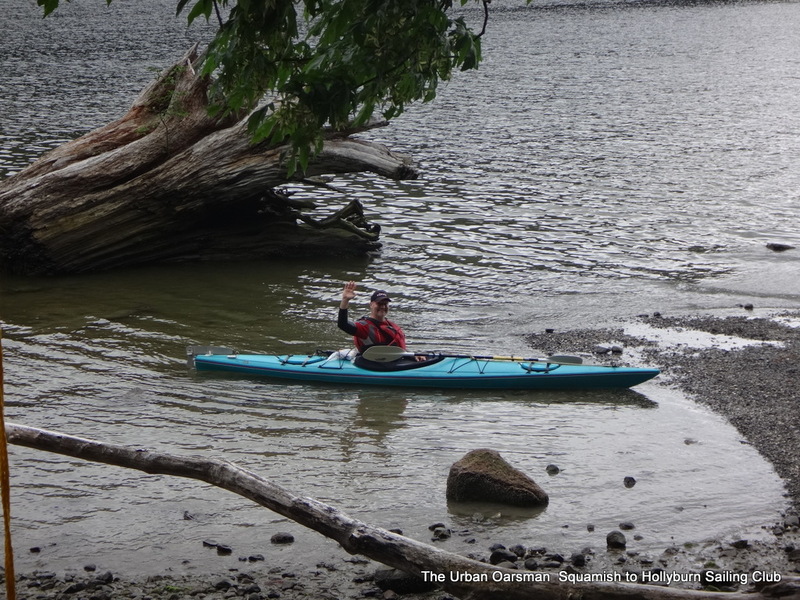 Maciej and Lars will paddle together…The kayaks are twice as fast as Gwragedd Annwn. 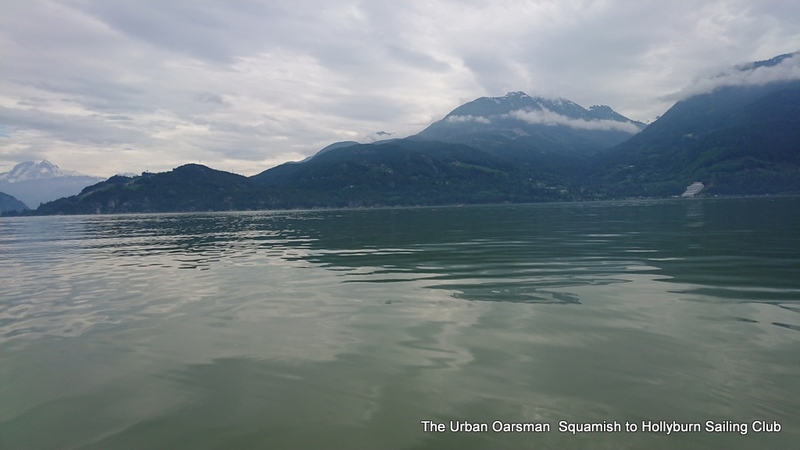 Leaving Squamish in the distance. 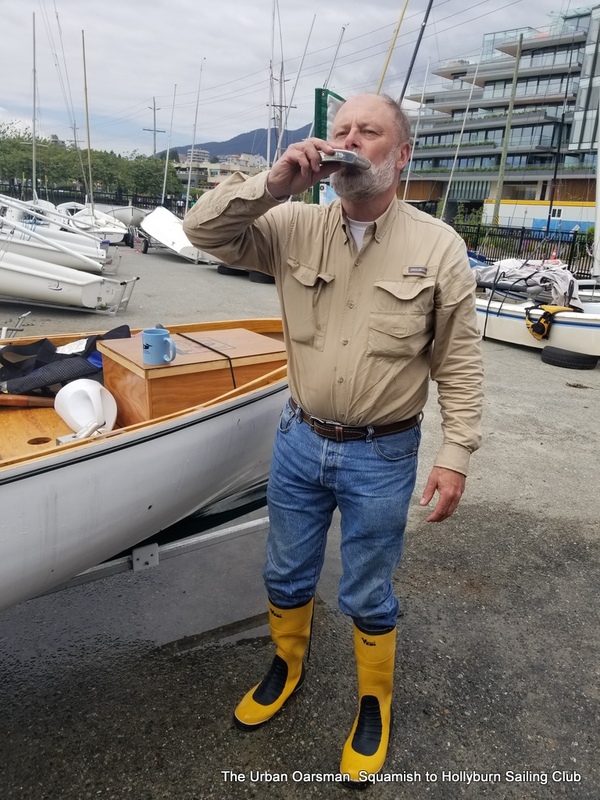 I take my sailing boots off and row in my runners. Waiting for me at Watts Point. Those two specks on the rock are Maciej and Lars. The real advantage I have in Gwragedd Annwn is I do not have to go to shore to get a snack or a drink or anything else. 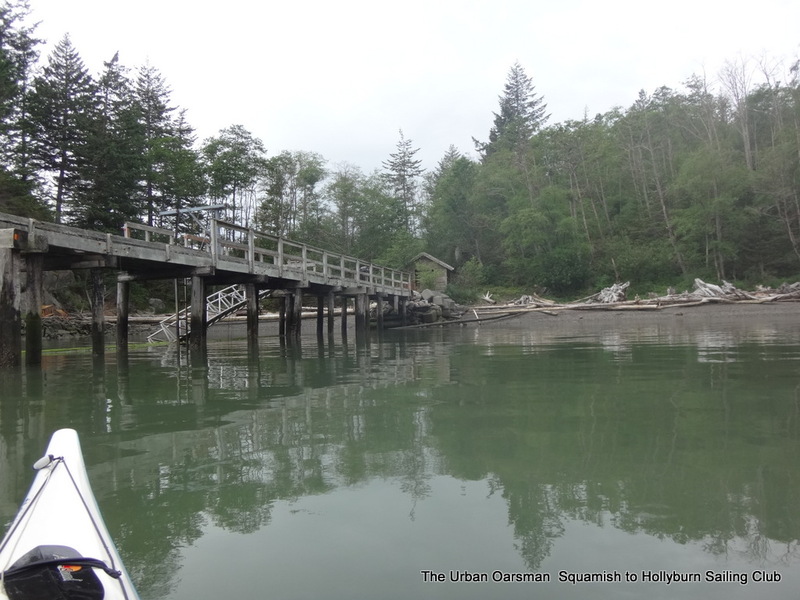 The kayakers have to. No break for the rowing. 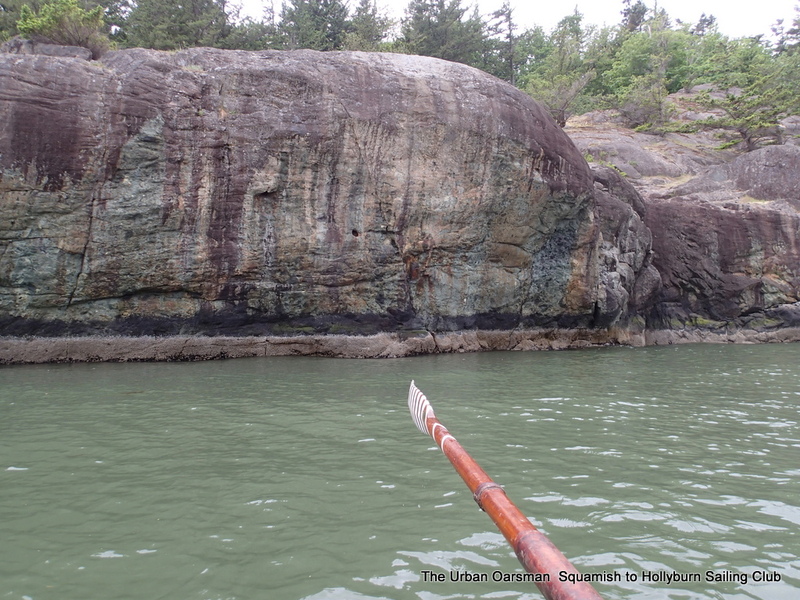 I row on, rowing by a breaking rock by the point. Breaking rock by Watts Point. It is almost 8:30 in the morning and conditions are still good. Gwragedd Annwn is down by the stern…I will have to move some cargo forward. I row on, past the Point, Maciej and Lars pass me again. The “cheetahs” of the sea pass me. 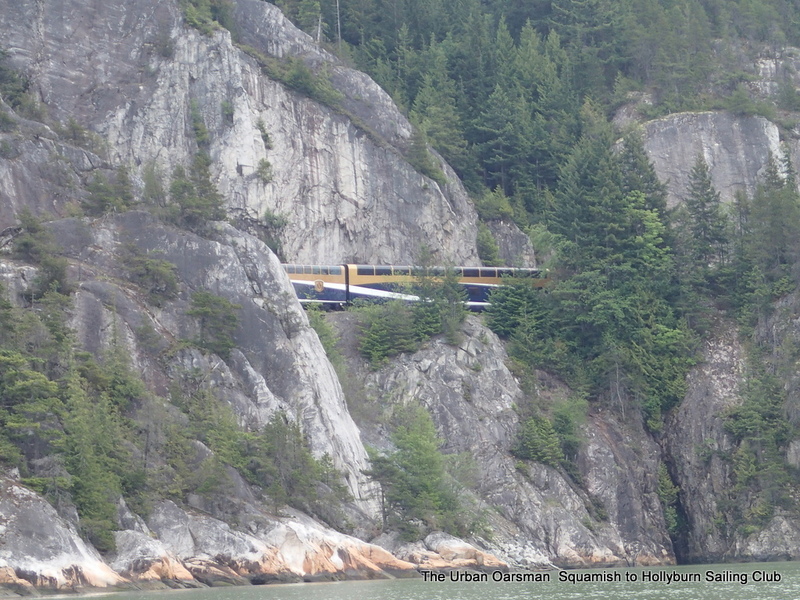 The Rocky Mountaineer heads up the Sound. 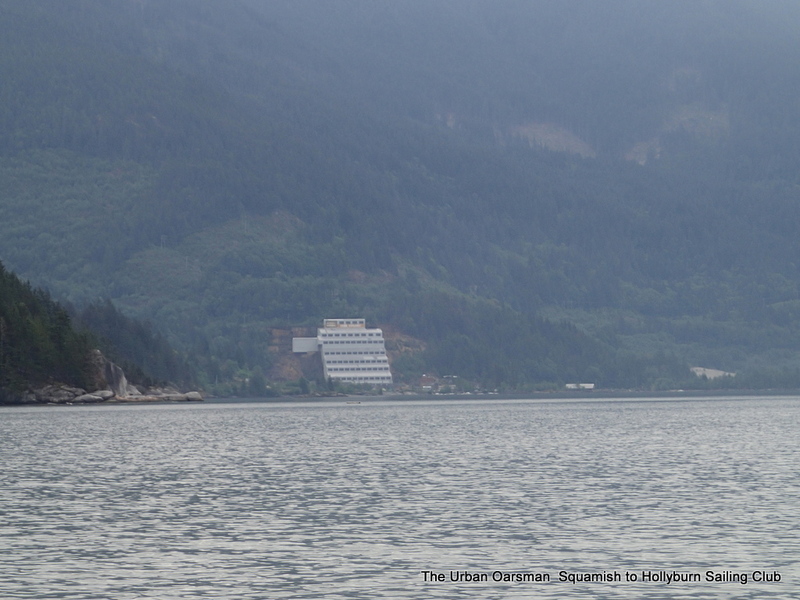 The BC Mining Museum is in the distance. View to the East from Gwragedd Annwn. I am so far behind, I am not even a speck! 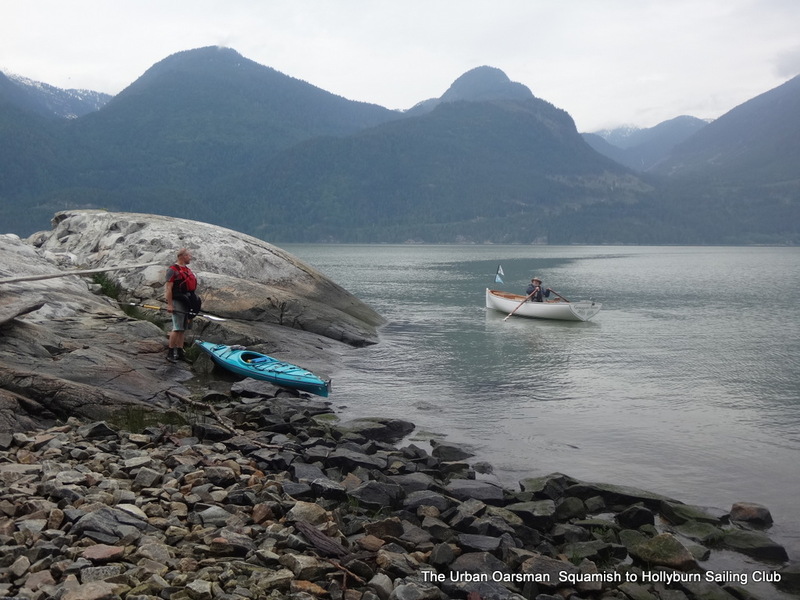 The kayakers go into Ts’itpsm (Zorro Bay). 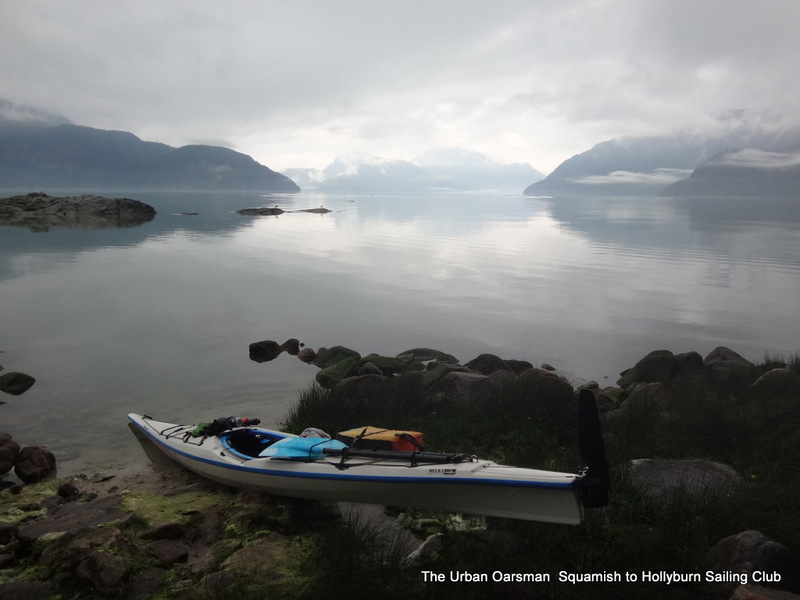 It is the kayakers job to set up camp so everything is ready when I arrive….at this rate, they will have a lot of time to do that. 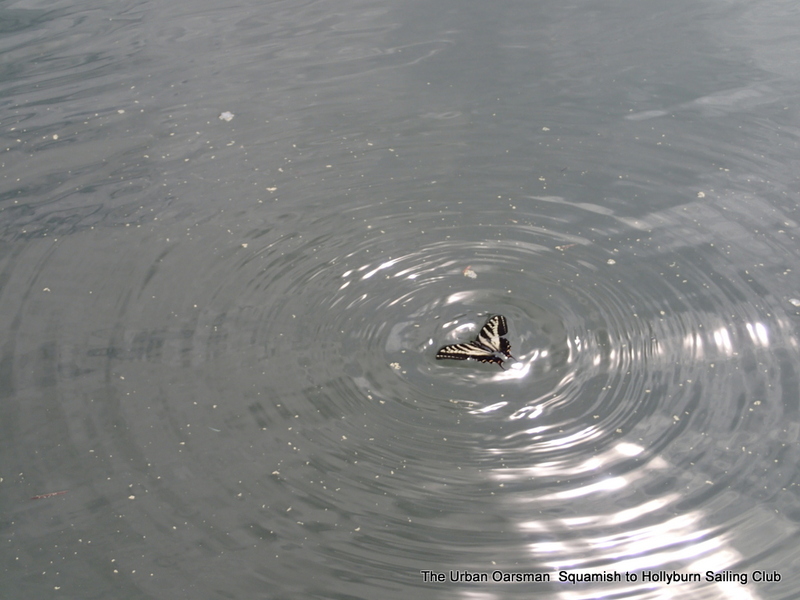 I spot a Zebra Swallowtail butterfly in distress. 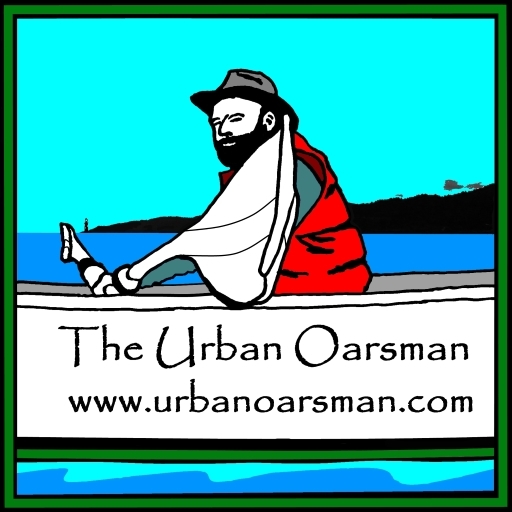 The Urban Oarsman to the rescue! 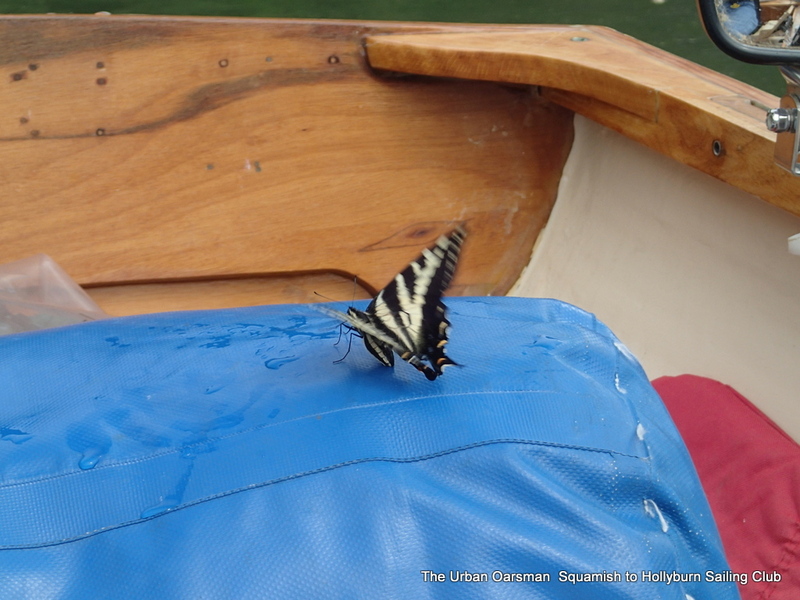 Rescued, I row the butterfly into shore. Entrance to the campsite. 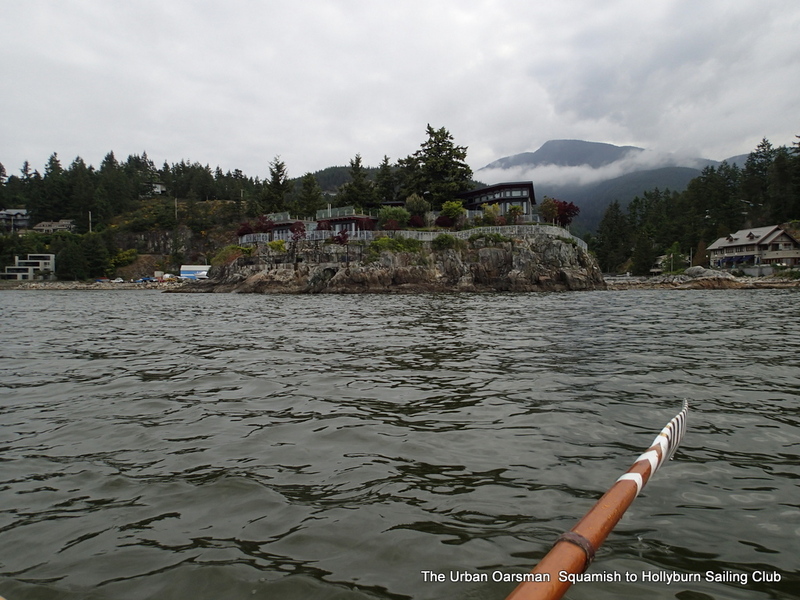 I am not going to bail out… I row around the bay and head on to Lhemlhemkwus (Islet View). Around the point and on towards Lhemlhemkwus (Islet View). One of the Defence Islands. 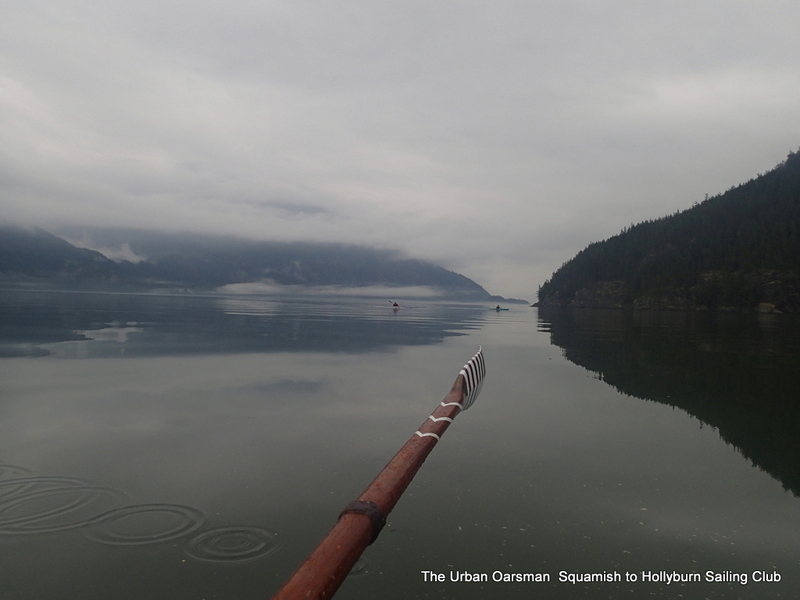 I row on. 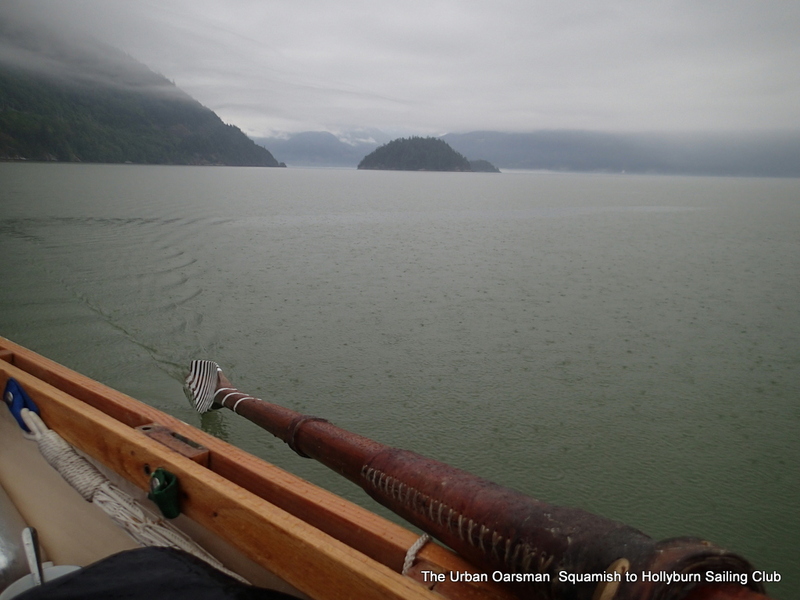 You can see my chart, #3311 sheet 2 of 5 HOWE SOUND, part of the Sunshine Coast series of charts. I had bought a map bag from MEC, but it was a little too small. I ended using a big “Glad” bag, $2.50 vs, $35 for the map bag. 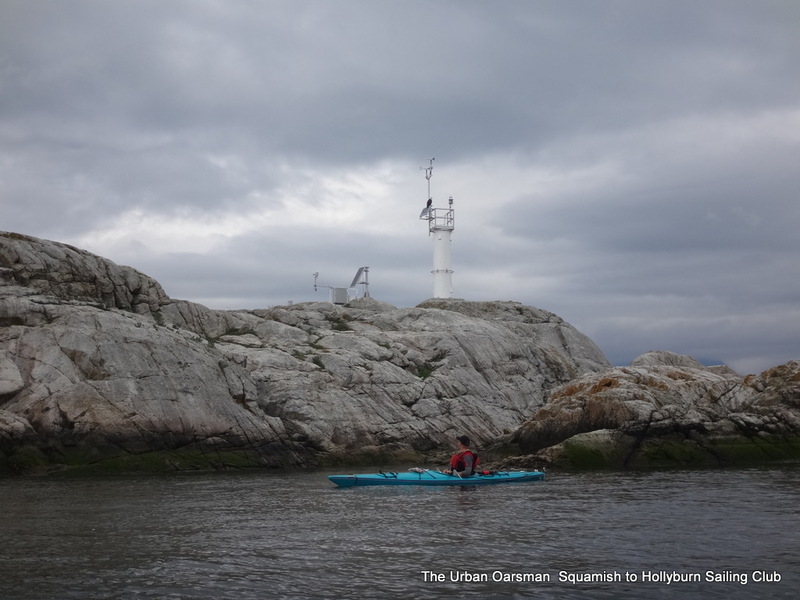 Hard rowing passing Defence Islands. 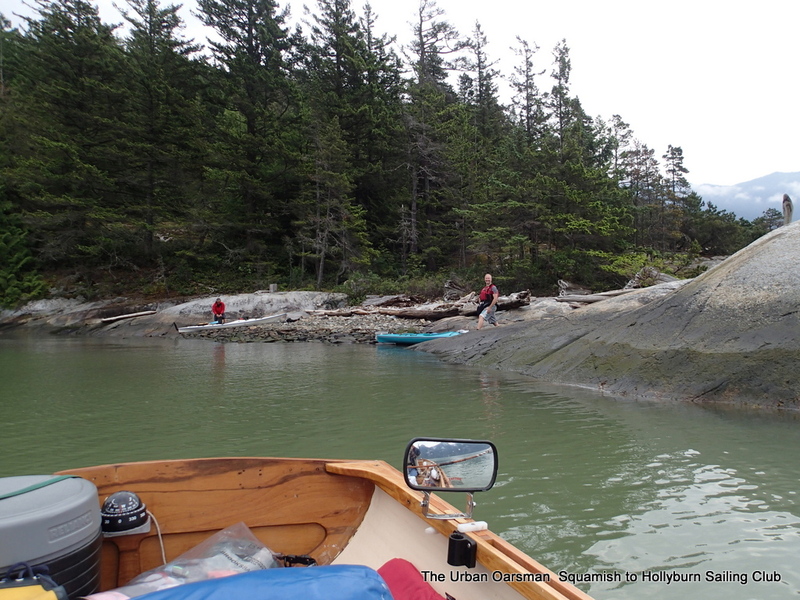 There is a 2 to 3 kilometer an hour counter current along the shore. Gwragedd Annwn’s progress slows to a crawl. 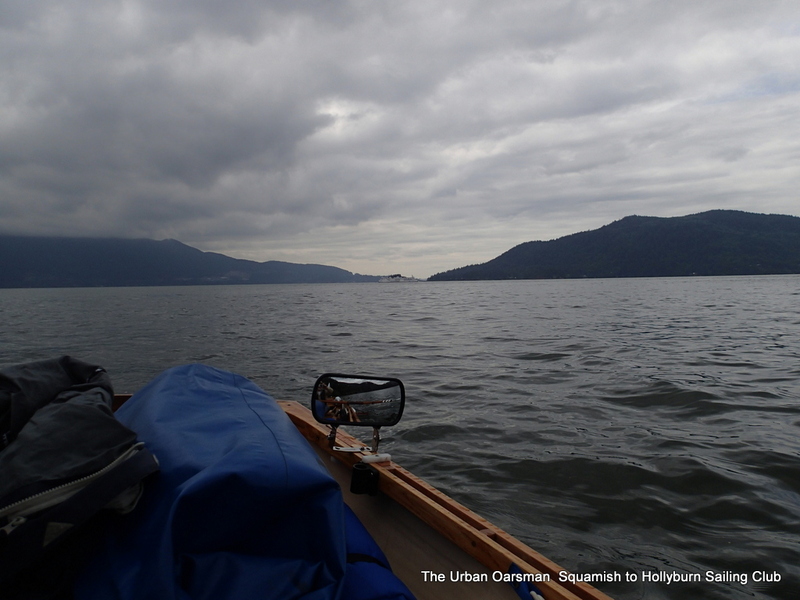 I row for a long time to go not very far. I arrive about 12:30pm. I find the campsite. 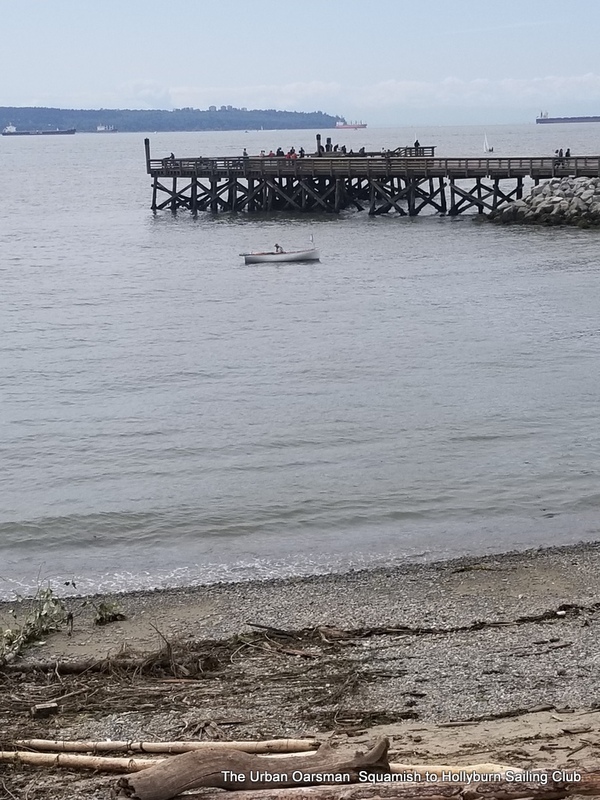 There is a cleared beaching site. I beach Gwragedd Annwn and shortly after, she is dry. I must admit, I am tired from the row, about 6 hours and 15 minutes at the thwart. I am going to anchor Gwragedd Annwn off of the beach. 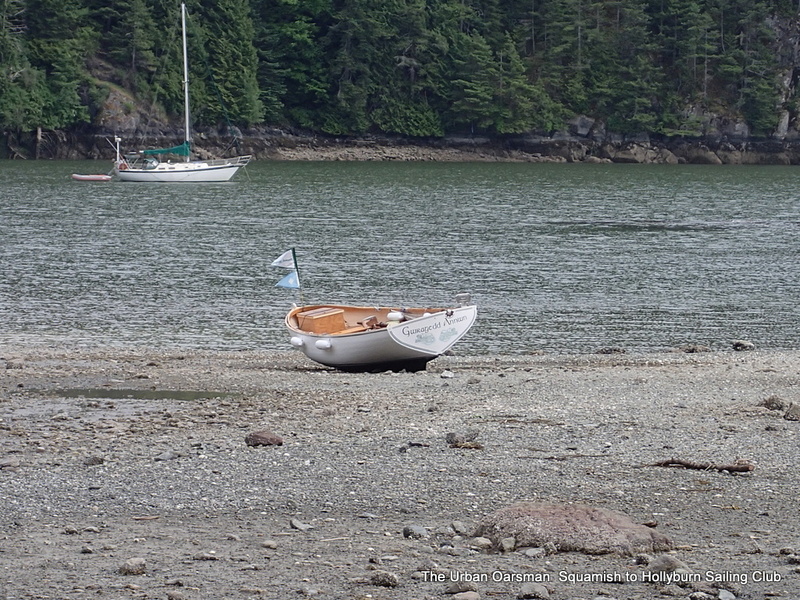 The tide will go out far enough for me to set her anchor by hand (or foot as it turns out). The tide is still going out to the low low tide. I have checked the tide tables, The tide will not be this low again tonight. I will have plenty of water for Gwragedd Annwn. Maciej and Lars have a fire going. Time for lunch. The current is flowing the wrong way past the landing area quite quickly. I am happy to be ashore. Maciej chops up some firewood using my axe..note to self, do not let him use the good axe! Oh well…I can grind out the dents when I get home. Maciej and Lars have set up their tents. I am going to sleep aboard Gwragedd Annwn. 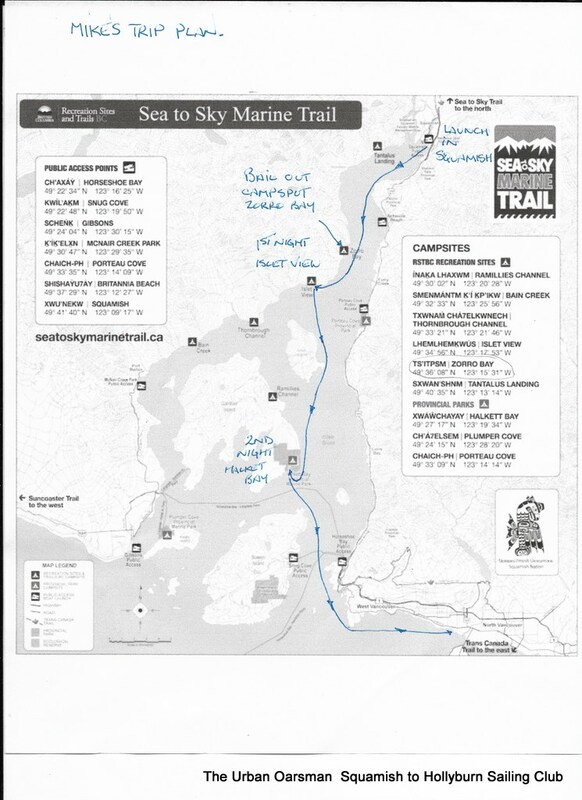 There is a slight change of plans, Maciej and Lars want to paddle down the West side of Anvil Island. 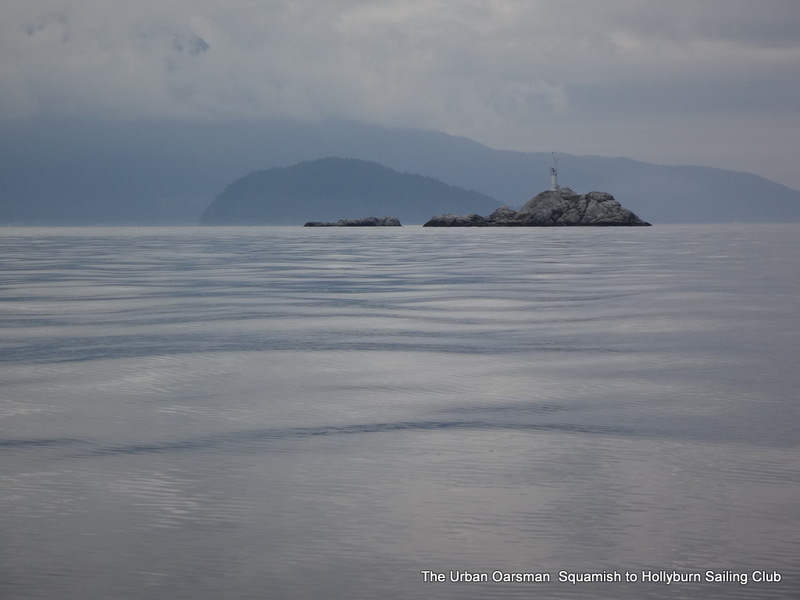 Fortunately there is cell phone coverage throughout Howe Sound. I call in and amend my trip plan…No sense looking on the wrong side of Anvil for us. Lars forgot his cup. Maciej makes him a new one. When the tide has re-floated Gwragedd Annwn, I board and prepare for bed. The current is still flowing to the East, even on the rising tide. Weird. 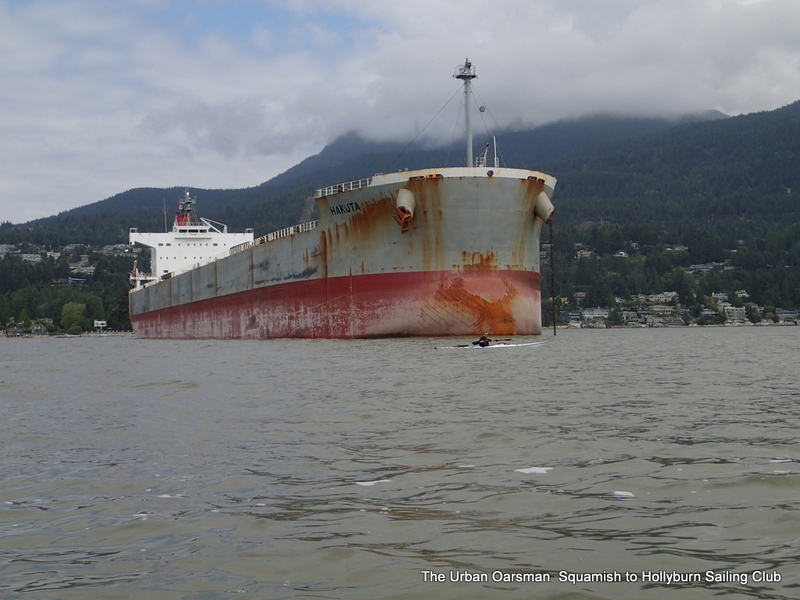 I am anchored and have a stern line to shore. Set for the night. Maciej says there is no rain forecast in the weather report. Great, it will be easier to sleep aboard Gwragedd Annwn than drag her up and then down the beach in the morning. The tide will be very high tonight and quite low tomorrow morning when we wish to leave. It takes a while to get organized. Because there is no rain forecast, I am not going to pitch my tent, I am going to sleep on the deck. 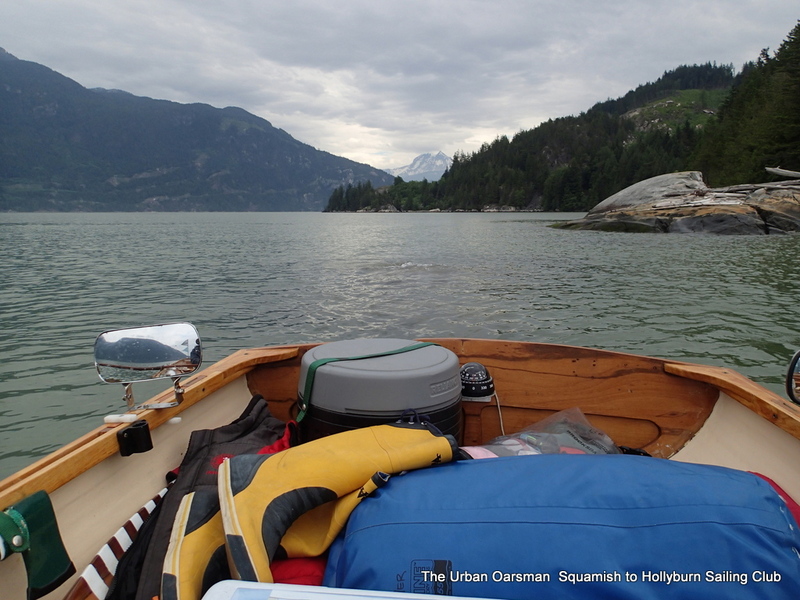 I still have to put the deck pieces in place, stow gear, assemble my camping cot and get my sleeping bag ready. I have my sleeping bag laid out, on top of a self-inflating mattress which is on top of my camping cot. As I prepare my bed, another couple has arrives. You can see their zodiac on the large stump. 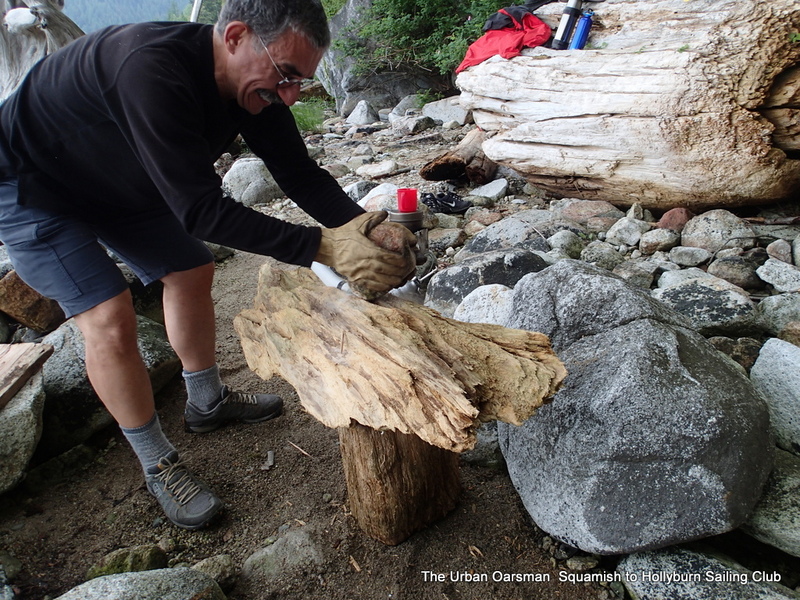 The tide will rise past the base of the stump. The current is still flowing to the East. 20 minutes of rain in the middle of the night. See the drops on the mirror. The weather liars lied. At around 12:20am, it starts to rain. I am uncertain as to what to do. 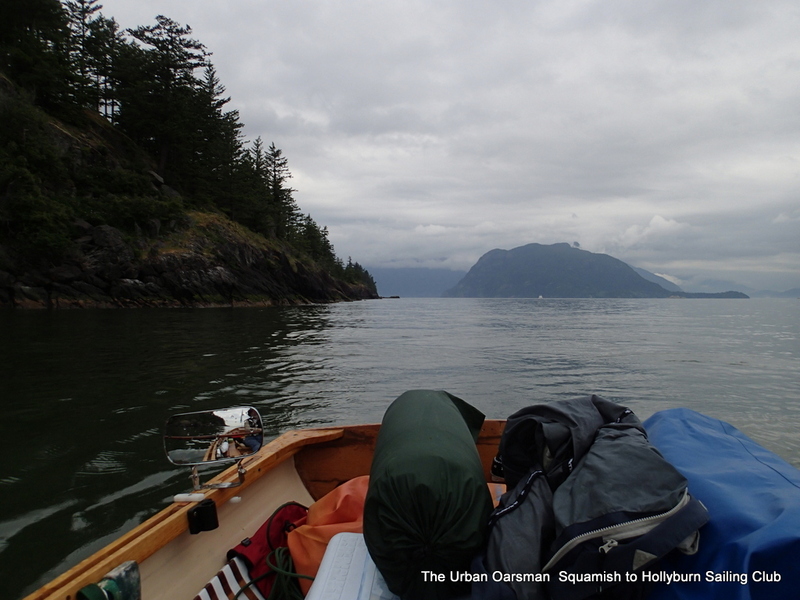 I have a tent, and I could go to shore and pitch it and sleep in my spare sleeping bag, but what a hassle. 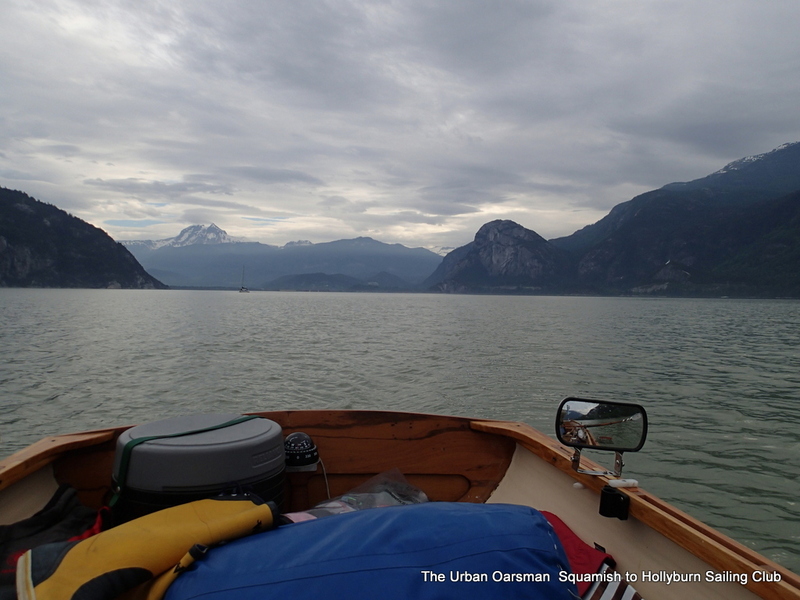 It is not raining very much, I am warm, so I decide to wait it out…I put my jacket over my sleeping bag, my hat over my head and hope that it stops soon. 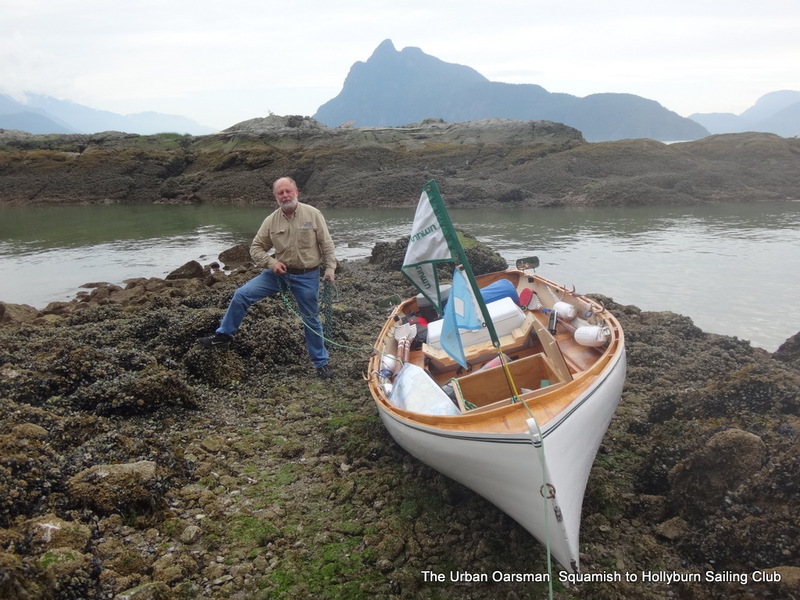 If I start to get cold, I will go ashore and pitch my tent and sleep in it. After 15 minutes or so of light drizzle, it stops. Saved!! Around 1:30 it begins to rain again. Rats! Again I decide to wait it out…It stops by 1:40pm. It is dry for the rest of the night. 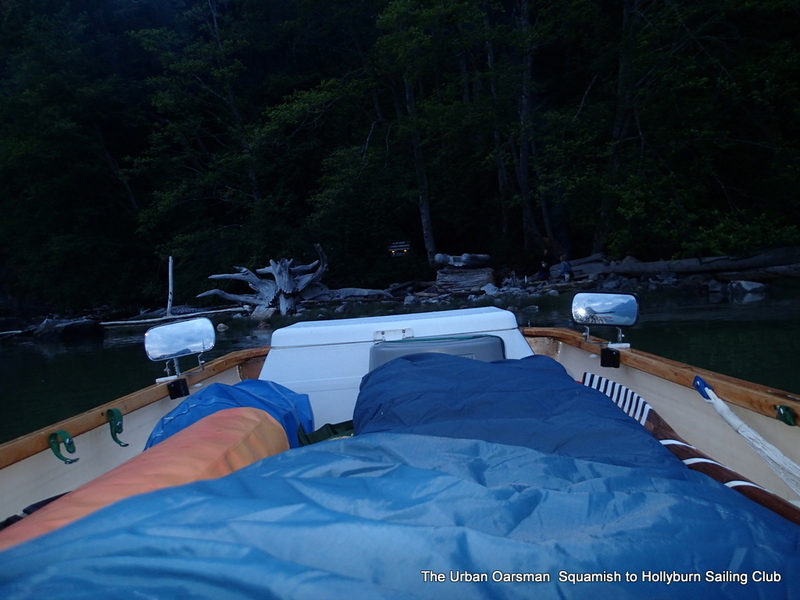 When I wake up, my sleeping bag is dry, my body heat has dried up all of the rain. Gwragedd Annwn’s decks are still wet. I carefully pack up. I go ashore, have breakfast with Maciej and Lars and set out. Leaving the campsite. Note the raindrops on the mirror. 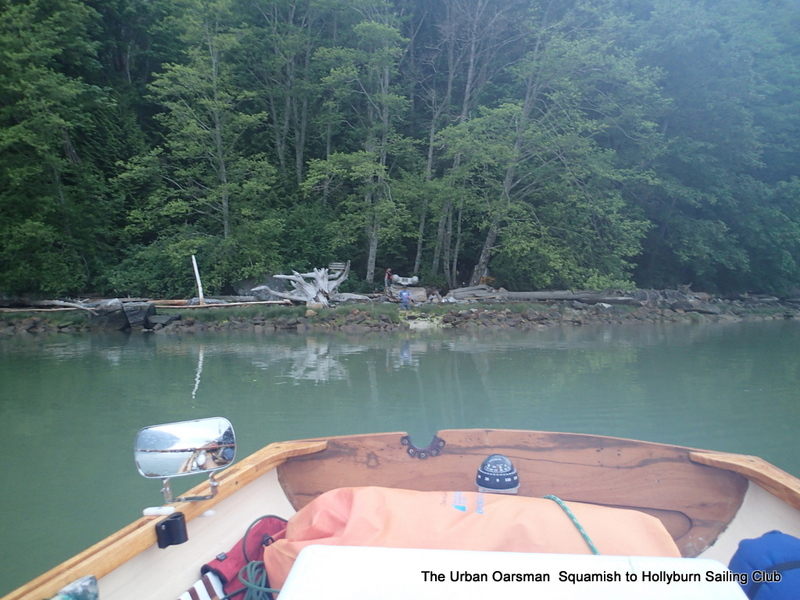 Again, I am the first boat out. The current is still flowing to the East. I am the speck in the distance. 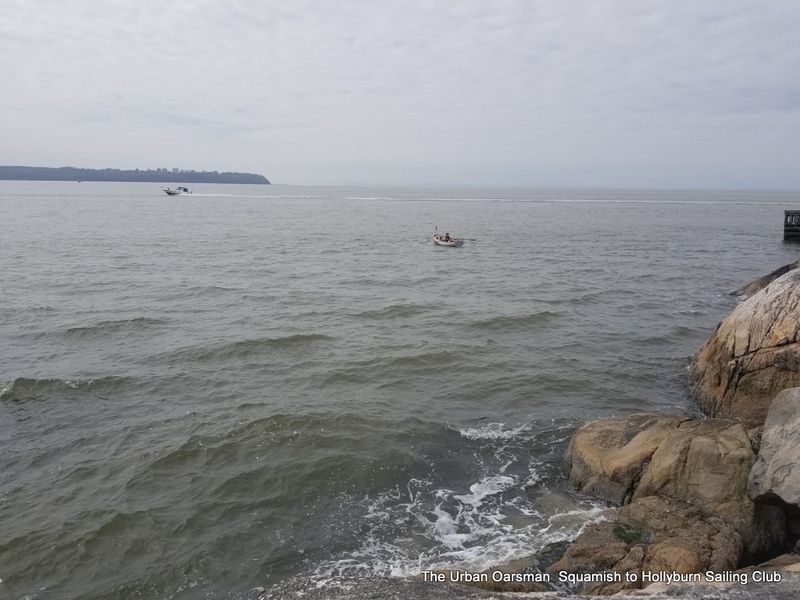 The current starts flowing to the West just past the islets. 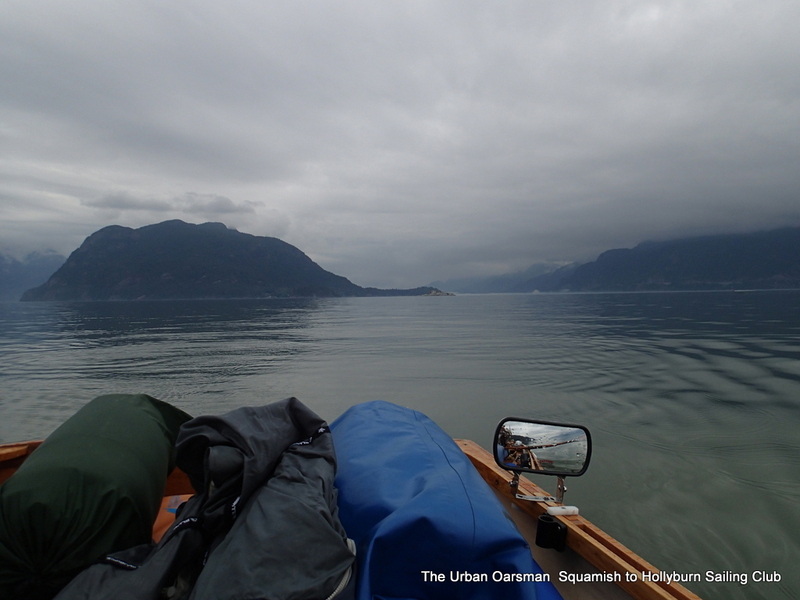 Looking back, it begins to rain again, but, at least I am rowing and warm. 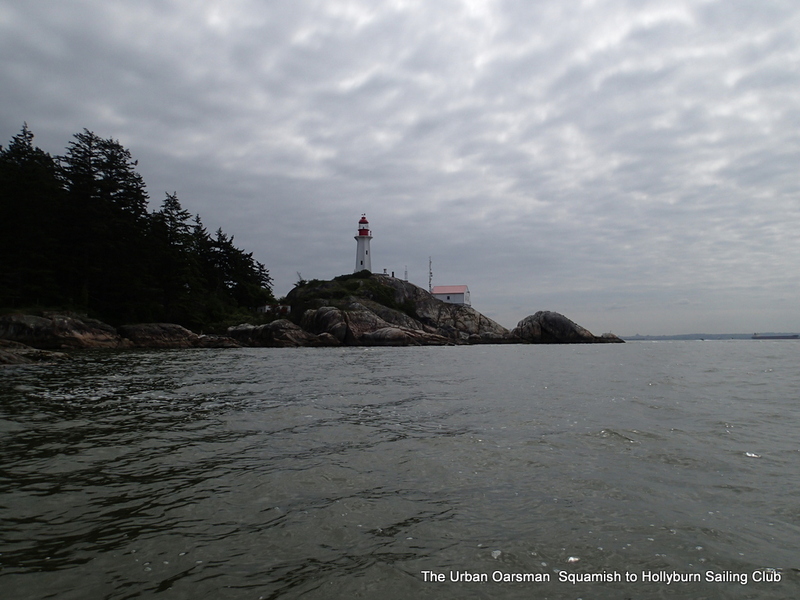 Not far from the islets, the current switches and now is pushing me to the West. Defence Islands to the East. It is raining a lot heavier that it did last night. I feel sorry for Maciej and Lars packing up in the rain. Maciej and Lars paddle out of the rain. West side of Anvil Island is to the right of the picture. 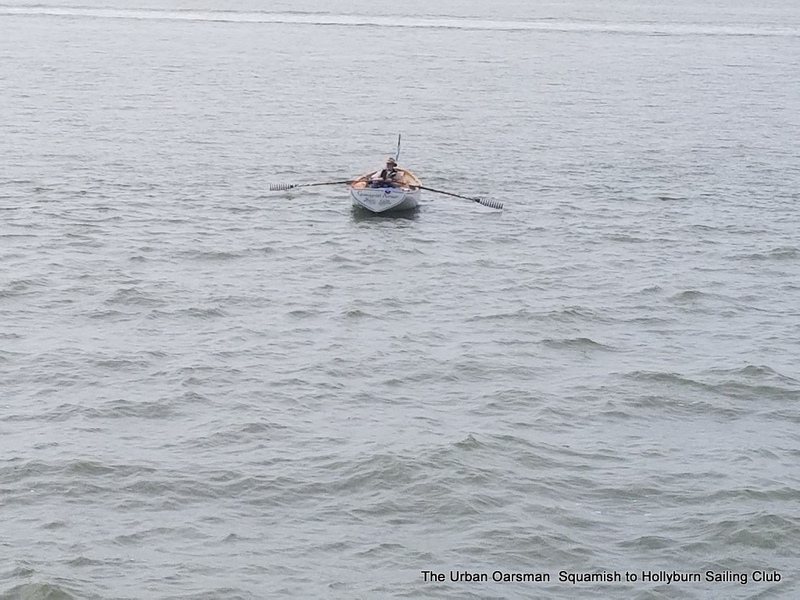 We share an orange and have a chat as they pass me….We will meet again at Halkett. 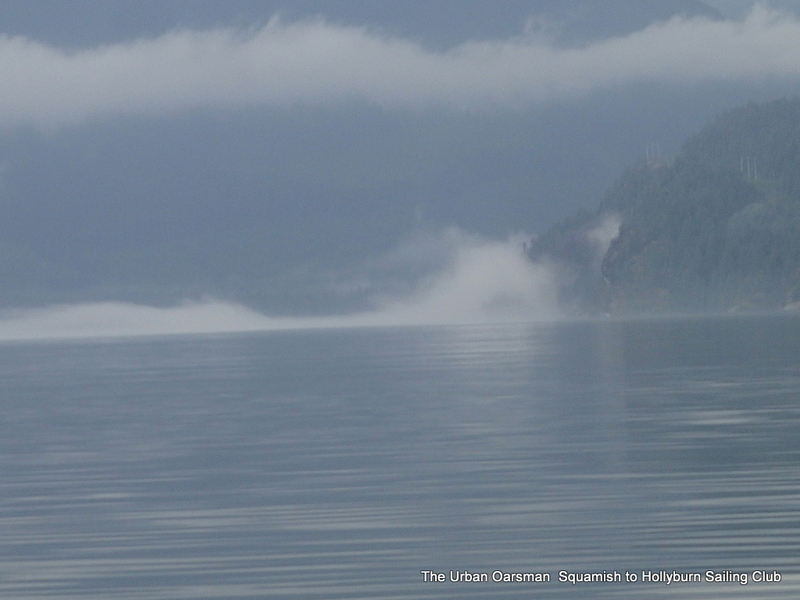 Confirming plans to meet in Halkett Bay. Gwragedd Annwn is sitting much more level. Maciej and Lars press on. Passed by the Cheetahs again. I can smell the mill. 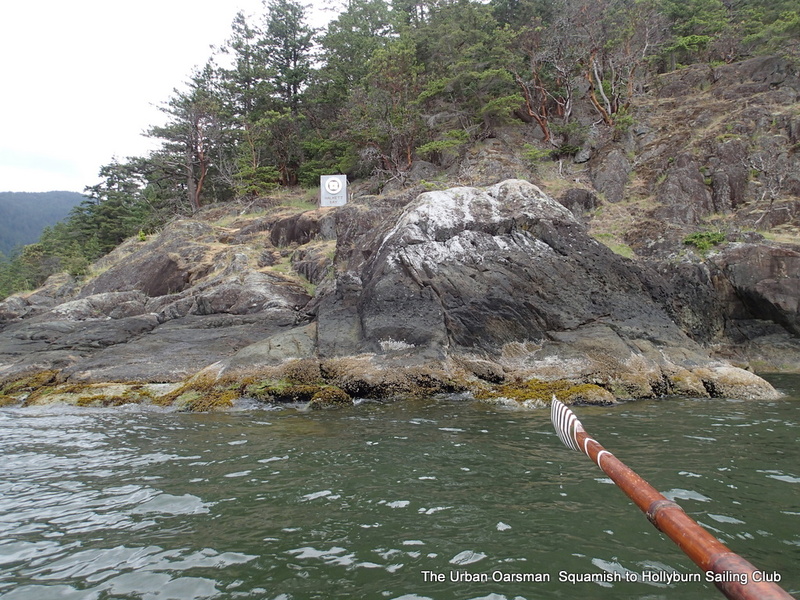 I row past Anvil Island. No landing here. 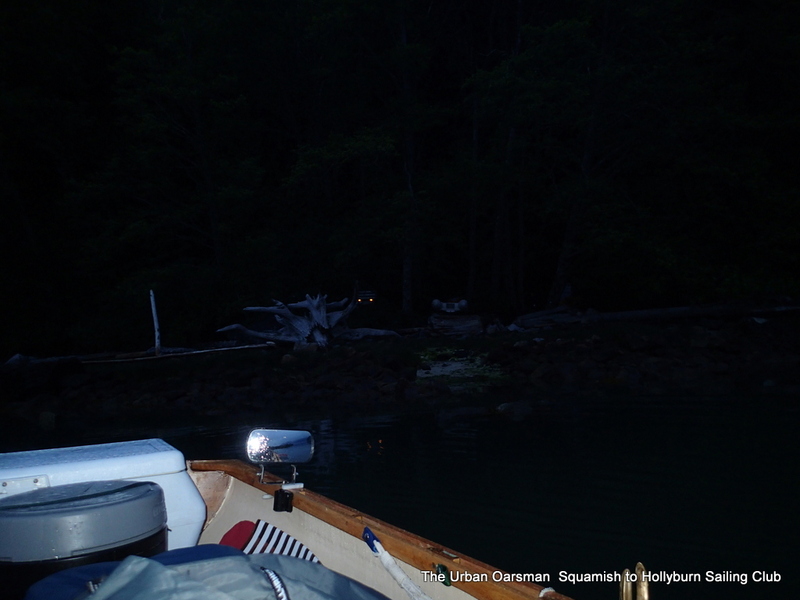 When you are this close to land, every turn seems to be another point of land. Conditions are still good…Maciej was right, conditions are usually better early in the morning. Maciej and Lars make a detour to Pam Rock. The sentry at Pam Rock. 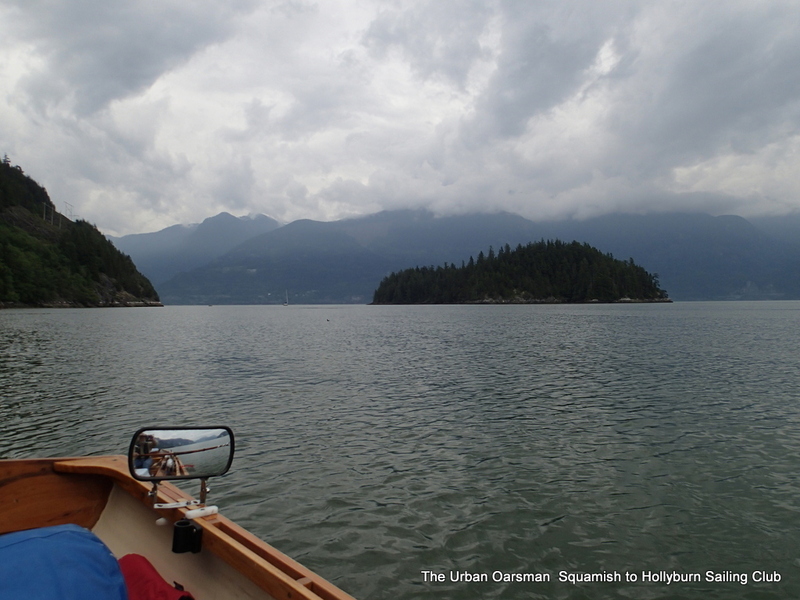 I, on the other hand, row straight towards Gambier Island. 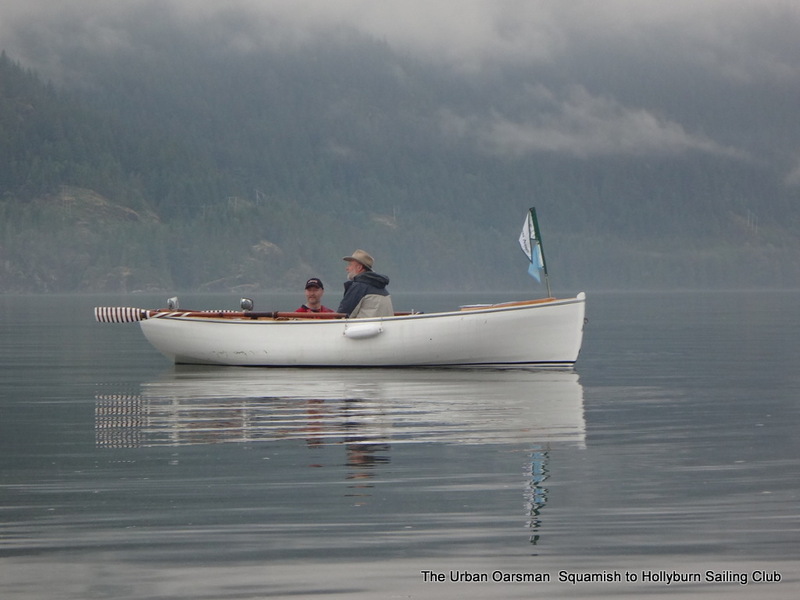 Rowing beside Gambier, Anvil Island in the distance. Most of my gear is dry. 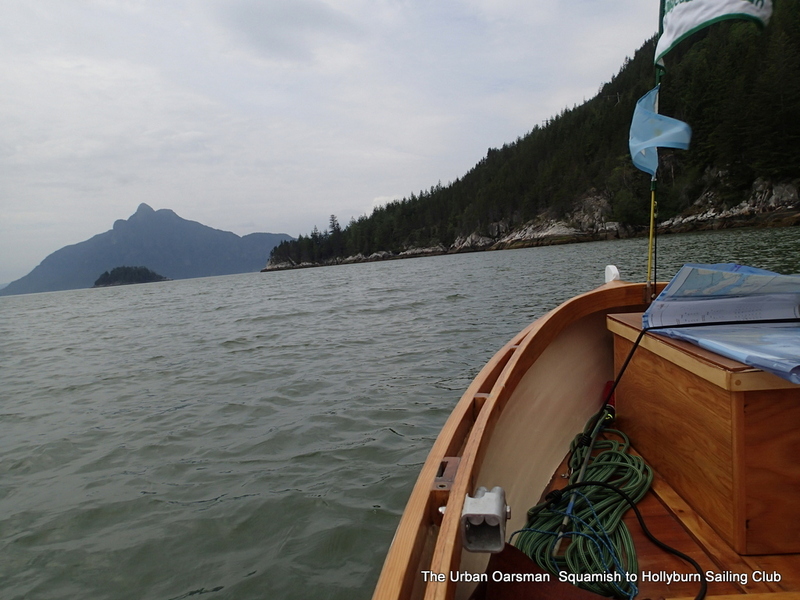 I continue on to Halkett Bay. 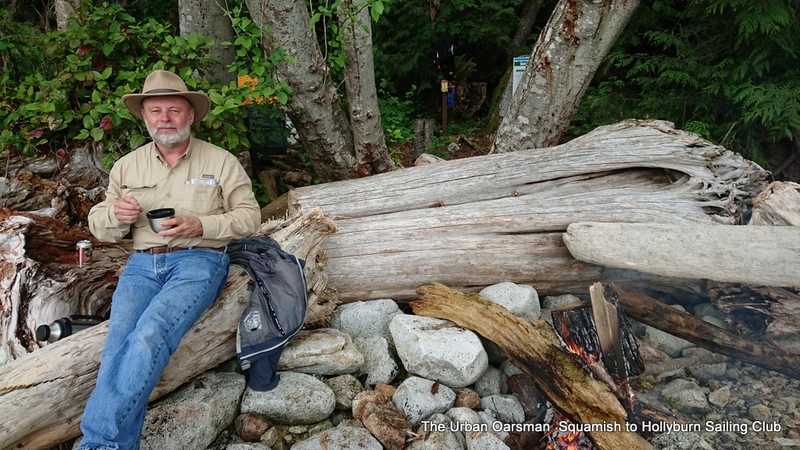 As I close on Halkett point, Lars calls me on the radio…the campsite is full and he is heading home, continuing on to HSC. Maciej is staying behind to find a campsite. 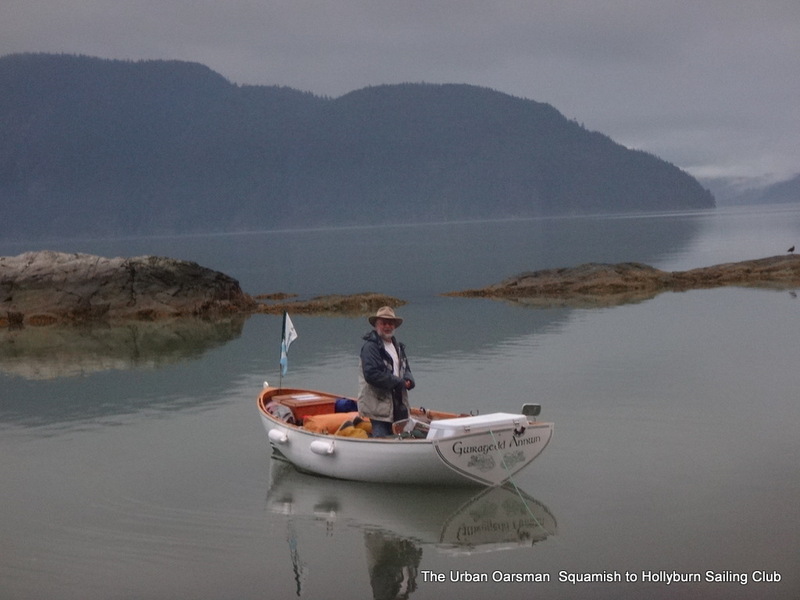 Lars leaving Halkett Bay heading home. 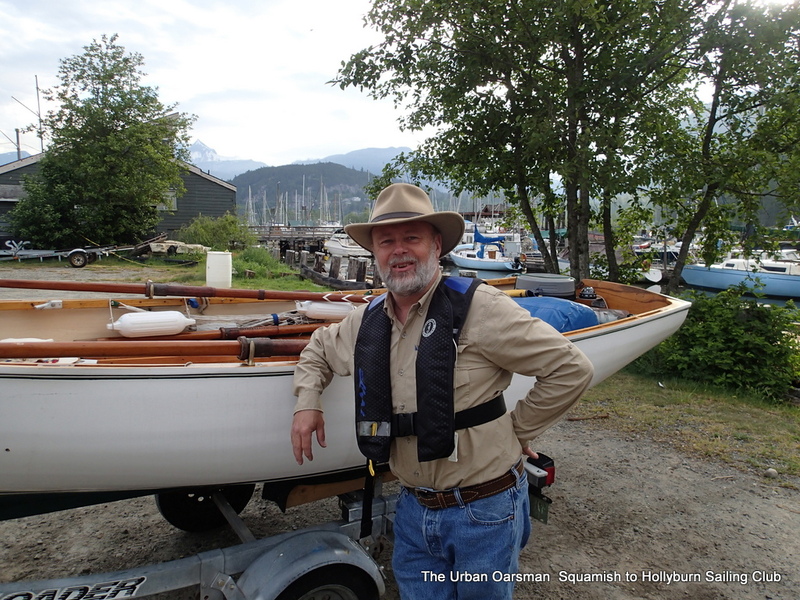 Lars will probably be at HSC before I get to Halkett Bay. Halkett Point. 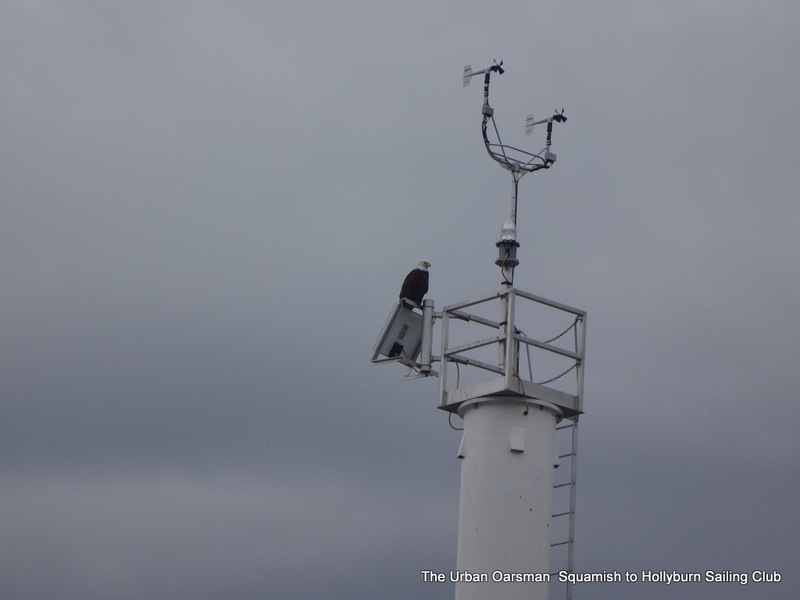 The wind begins to pick-up from the South East. Not much further now. 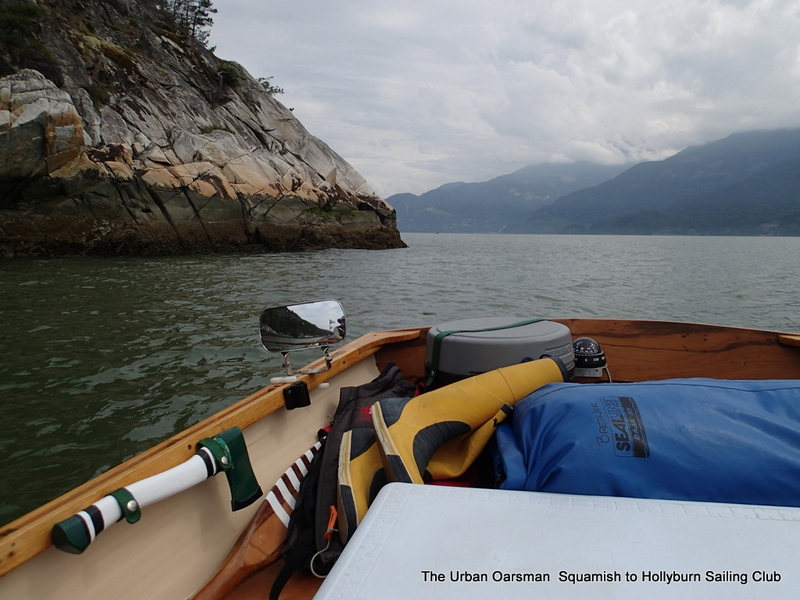 The wind picks up more for the run into Halkett Bay. 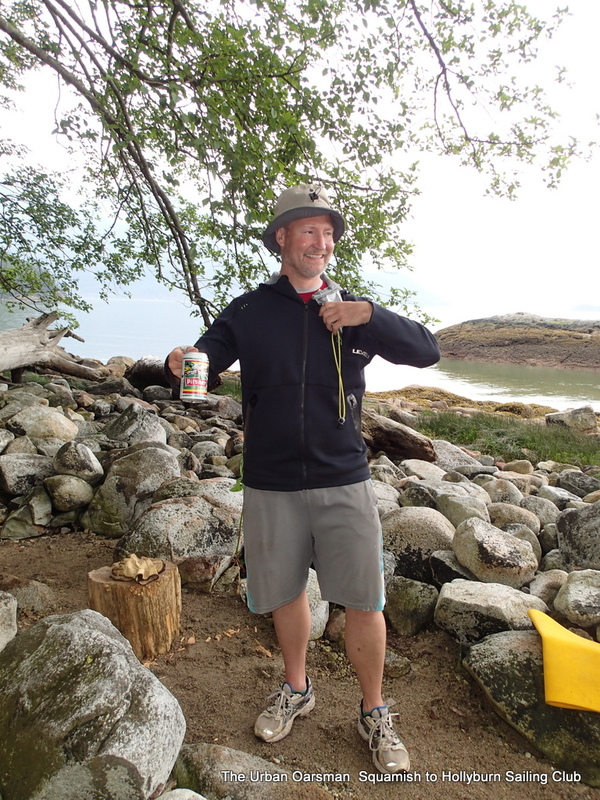 When Lars left, the tide was past the big stump behind him. I beach Gwragedd Annwn. Maciej and I quickly discuss continuing on to HSC. 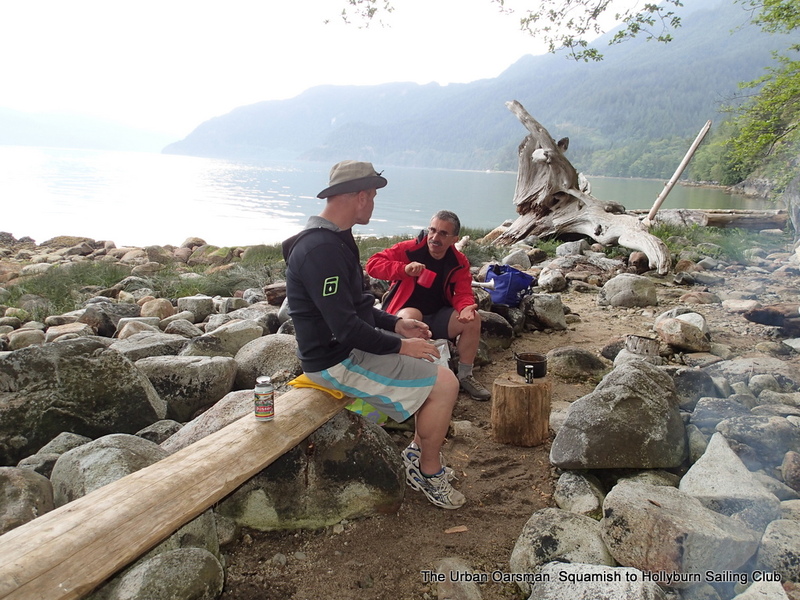 Maciej has found a good campsite and we decide to say. I go ashore to the campsite Maciej has found. About 5½ hours at the thwart. Gwragedd Annwn on the hard at Halkett Bay. 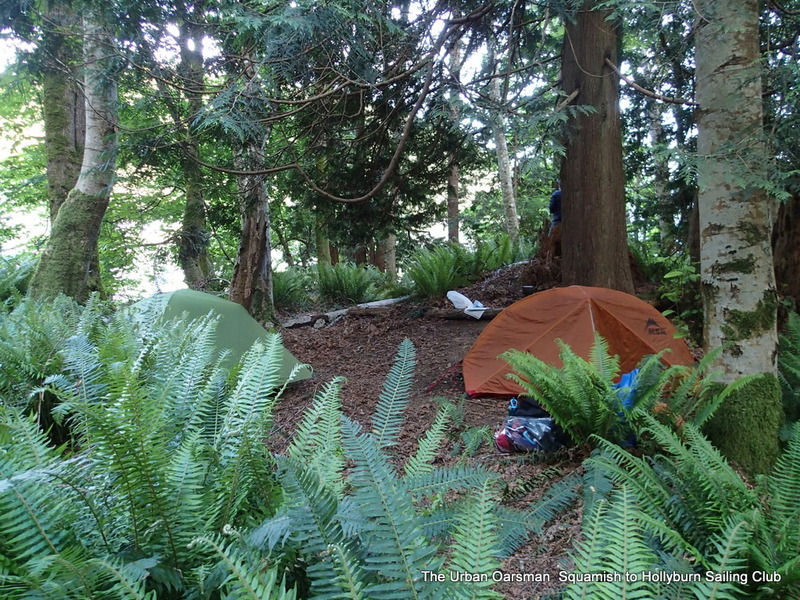 Our campsite in the fern forest. A toast to being here. I turn in for a nap. As the day progresses, some campers leave, the tide comes in, space open up and I can tie Gwragedd Annwn to the dinghy dock. We get word that Lars is back at HSC. 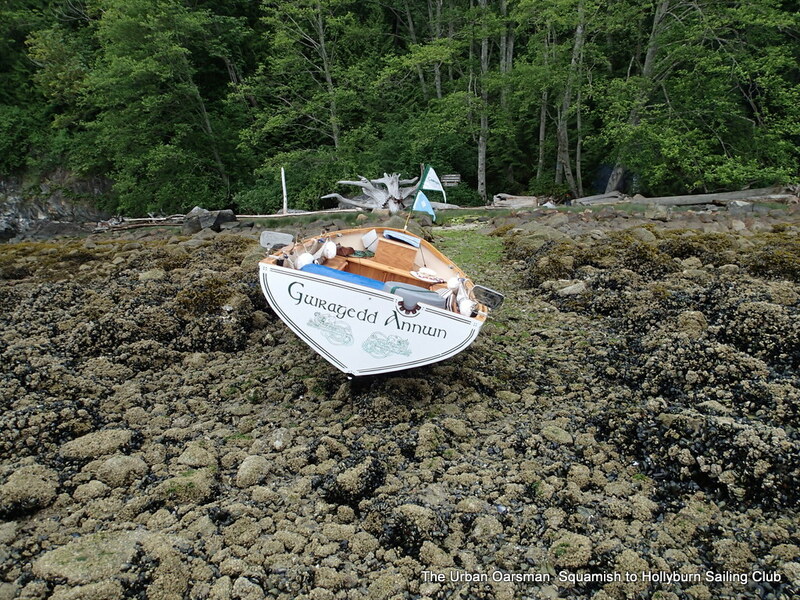 Gwragedd Annwn at the Halkett Bay dinghy dock. We will have another long day ahead of us, so we turn in early. The loud music starts by 9pm and then abruptly stops at midnight. No music no more voices. Did a ranger make a visit? 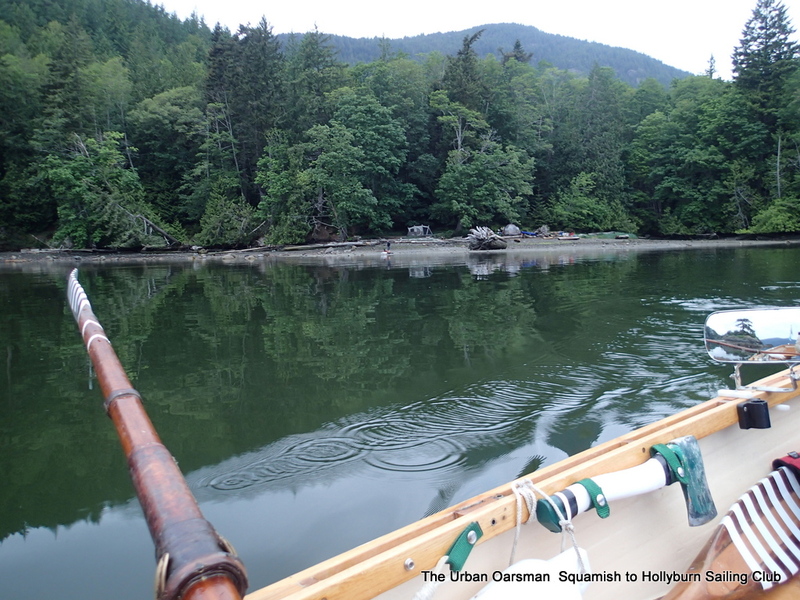 I row Gwragedd Annwn over to the beach below the campsite and load up. 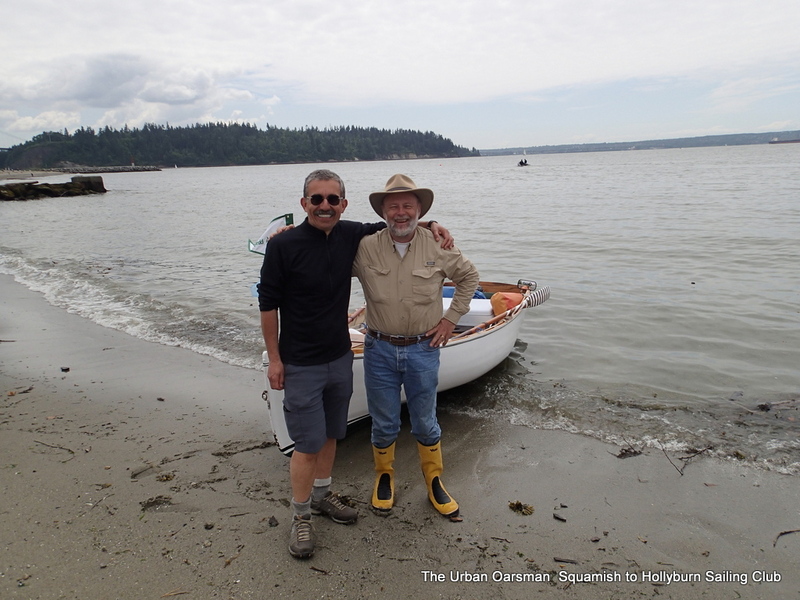 I help Maciej carry his kayak to the water. I get a head start while he loads up. He will catch me shortly. 6:25 am, I am on my way. 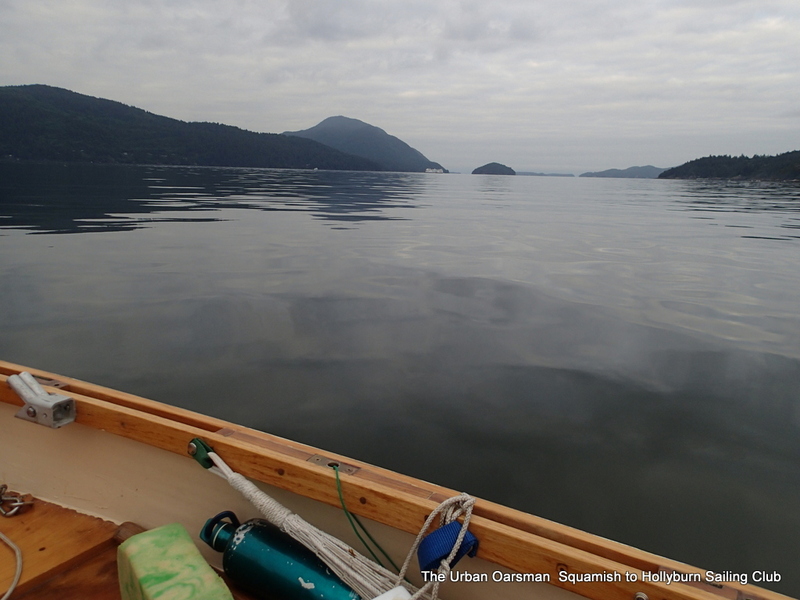 Conditions good, flat calm, no wind. 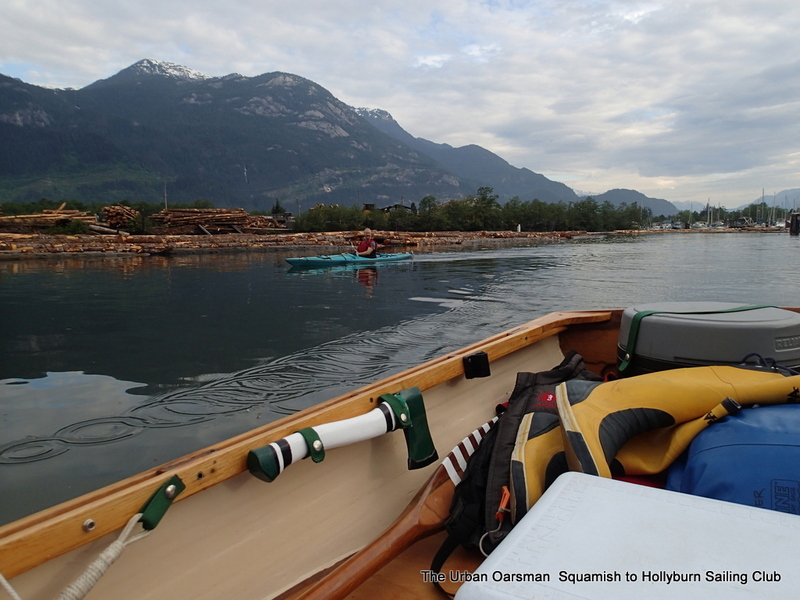 On my way, Langdale ferry in the background. Maciej and I will have to watch out for the ferries. 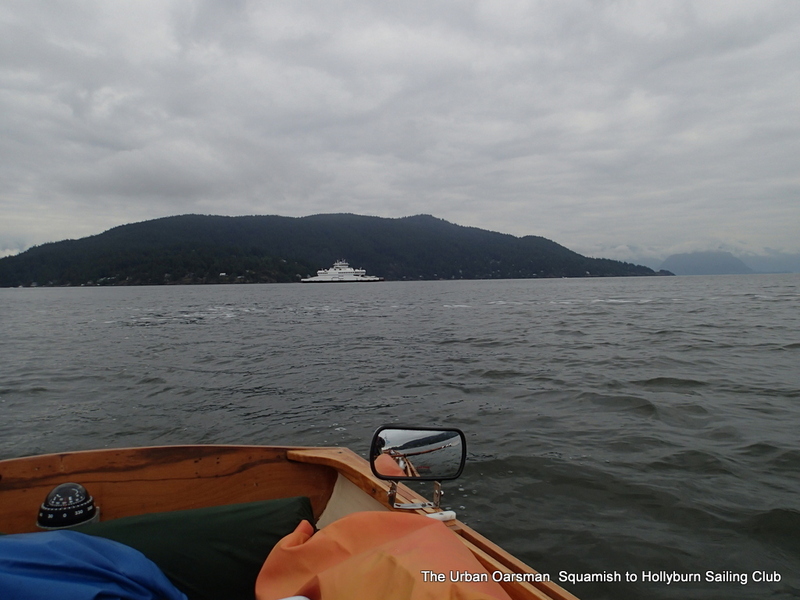 Finisterre Island to the left, Bowen Island to the right. 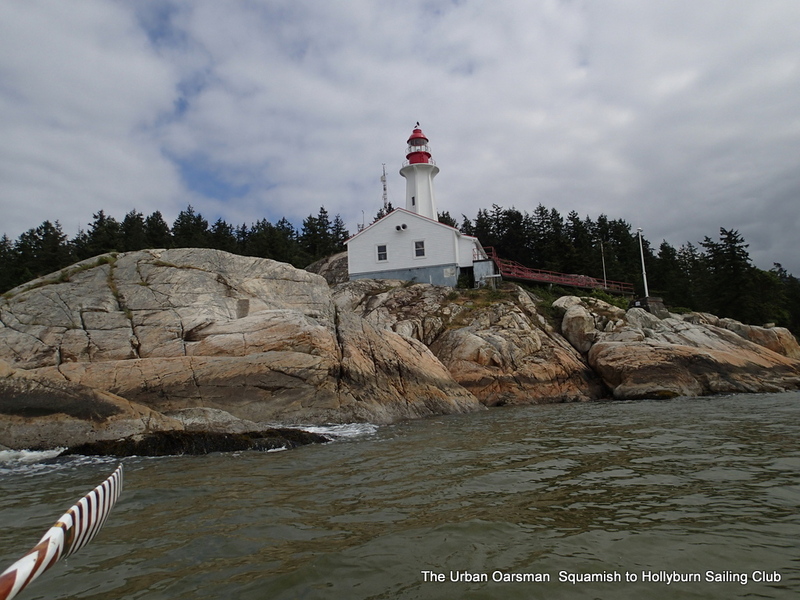 Maciej is going to try to go between Finisterre Island and Bowen Island. I do not think that the tide will be high enough for Gwragedd Annwn to make it. I go around. 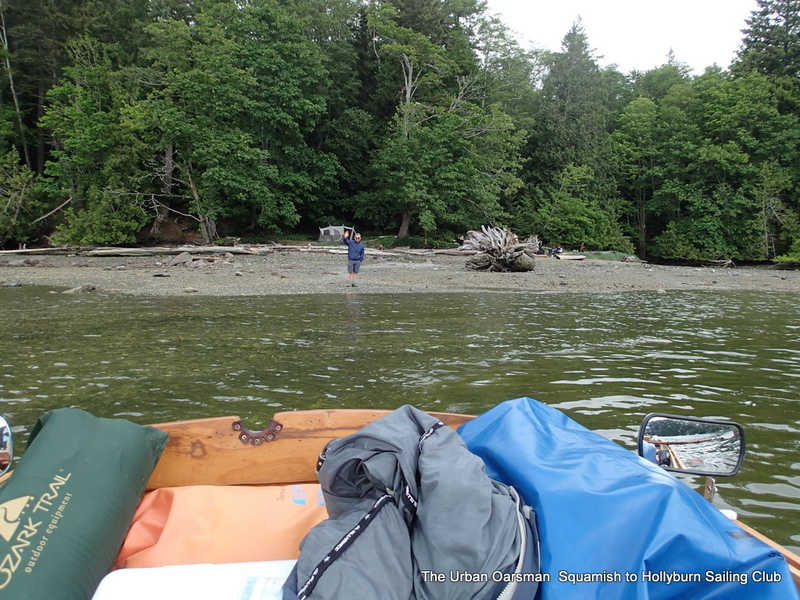 The tide is too low even for Maciej, he carries his kayak across the spit. 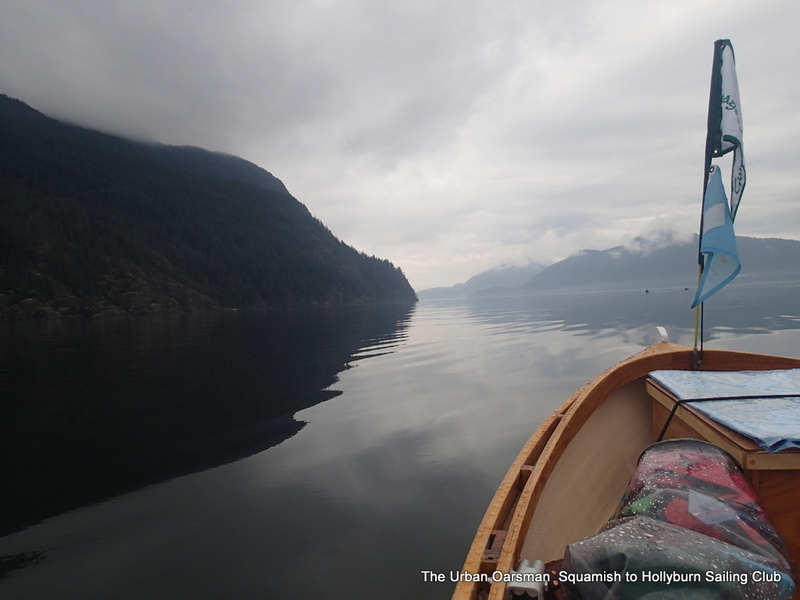 Maciej and I had intended to cross the Queen Charlotte Channel together. Here we are discussing the crossing. There is a problem. 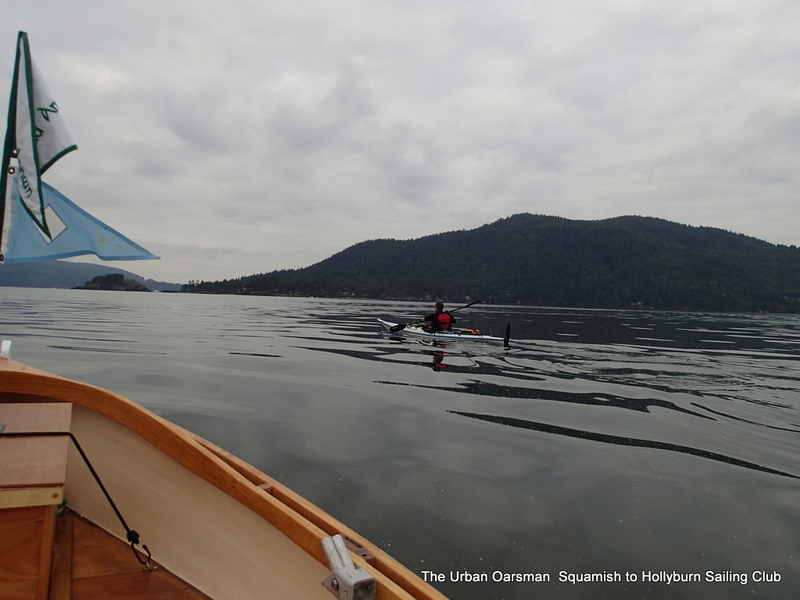 If Maciej paddles slowly enough for me to keep pace with him, he gets cold! 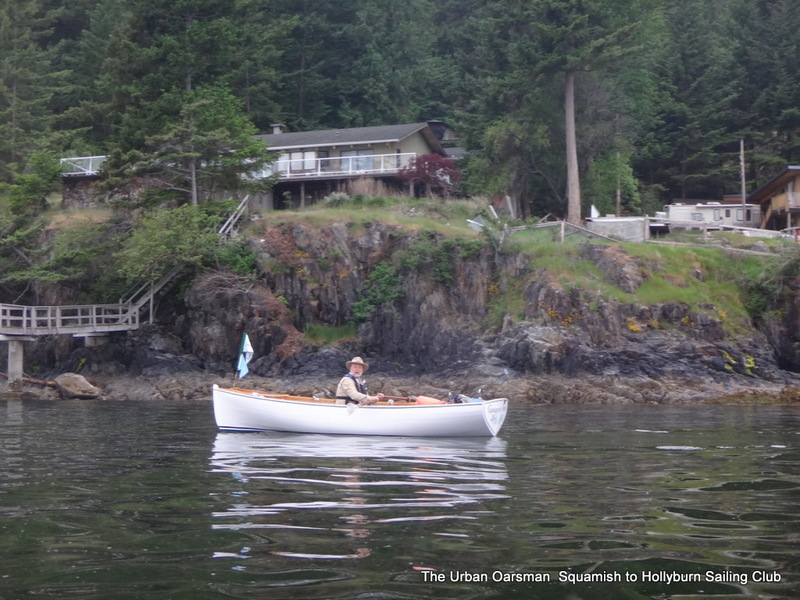 We decide to cross at our own pace and meet just past Point Atkinson, in Starboat Cove. We have two ferries to dodge. 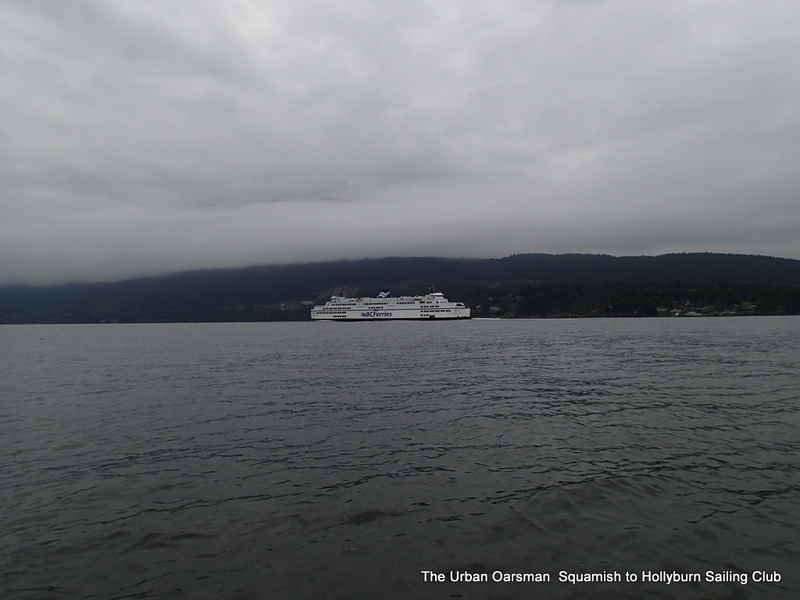 The Bowen and Nanaimo ferries. 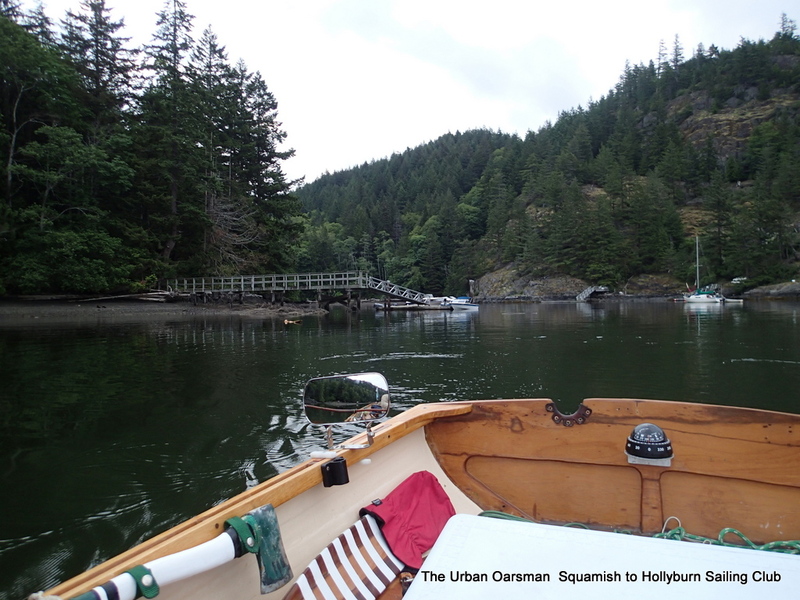 I see the Bowen ferry and stay to the North of her route to Snug Cove. 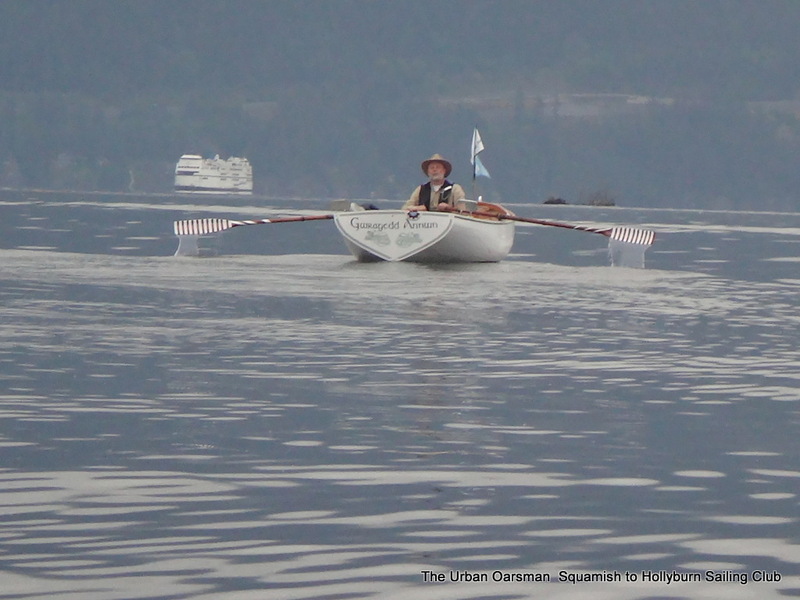 When she passes, I row on. 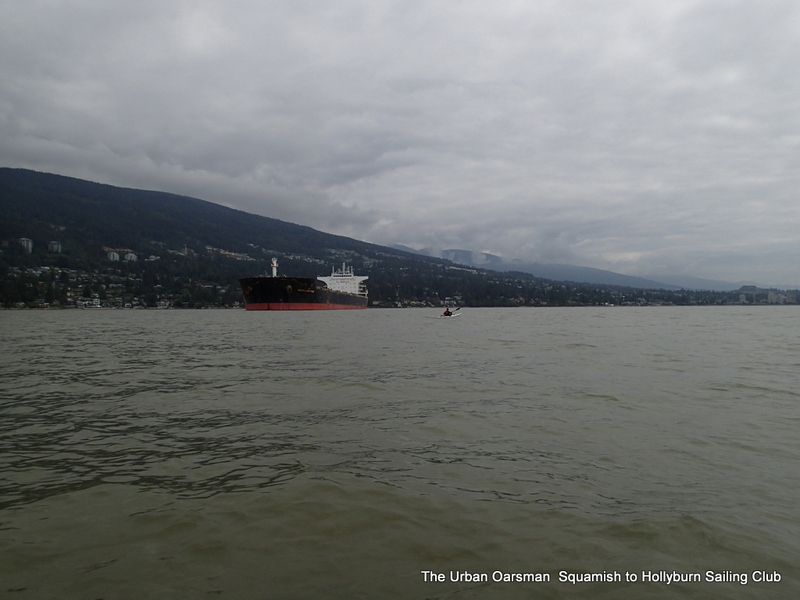 I spot the Nanaimo ferry quite far out but I will never be able to cross her route in time. I stay to the South West of her route until she passes. 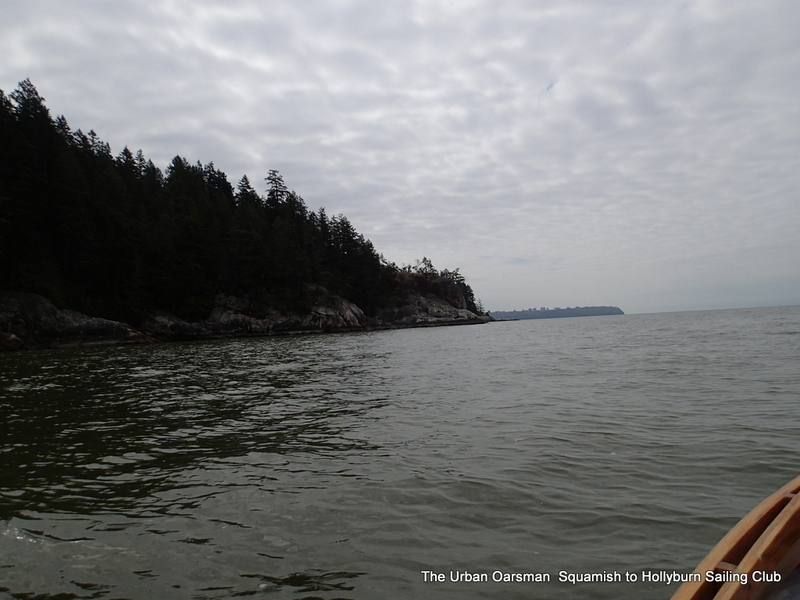 Nanaimo ferry past, White Cliff Point. 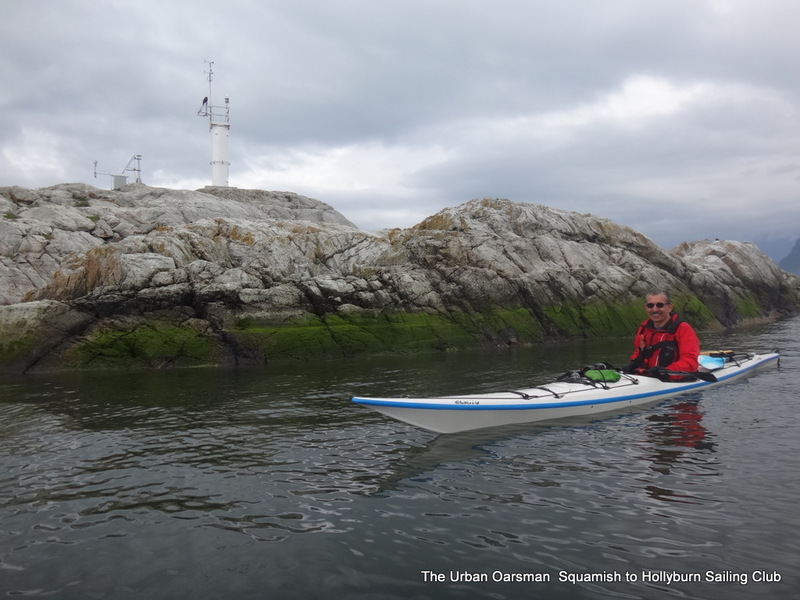 I row past White Cliff Point, Whyte Islet, Bird Islet, Batchelor Point, Fishermans Cove. 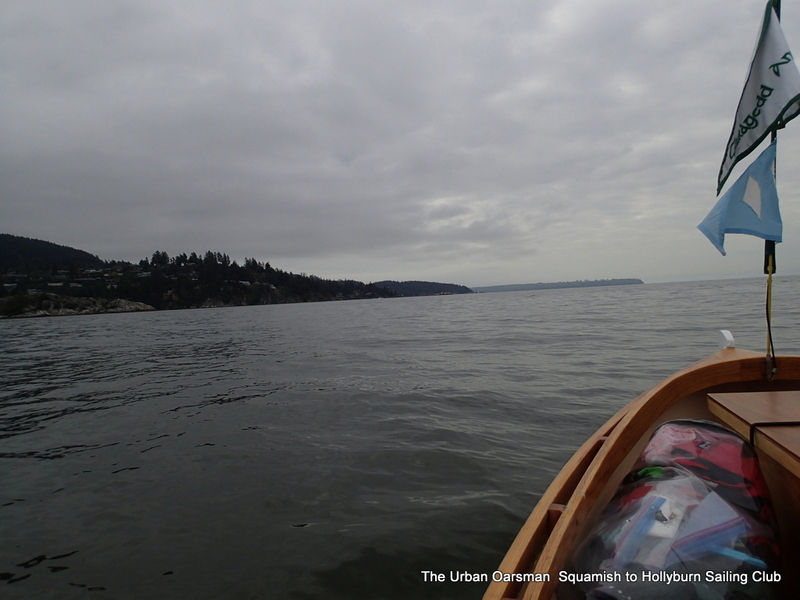 The rowing gets tougher…I have run head-on into a counter-current. 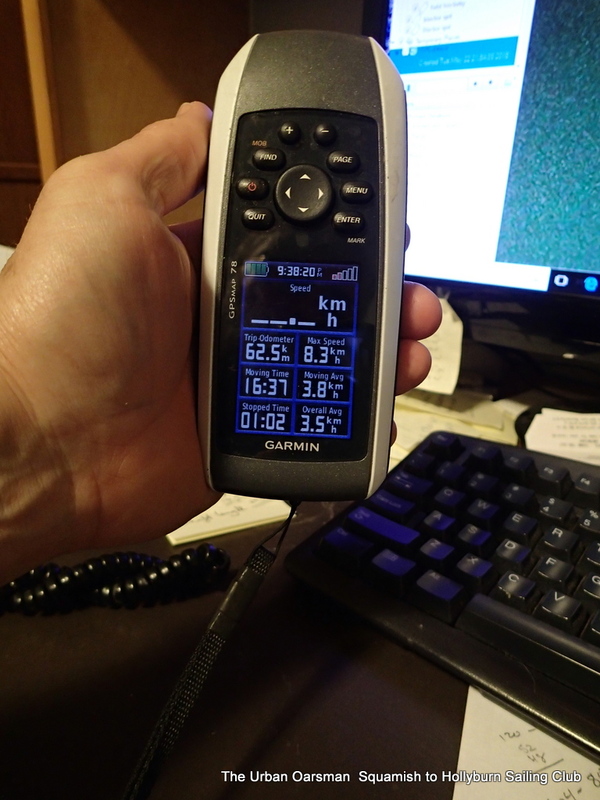 My speed over ground slows to less that two kilometres an hour. 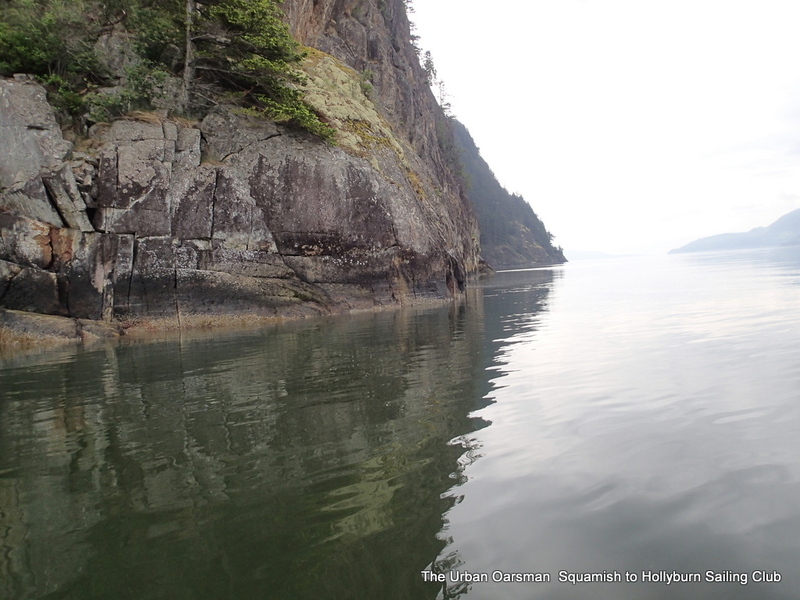 I creepy-crawl past Grebe Islets, Indian Bluff. Point Atkinson, the Lighthouse at last! The going to here has been painfully slow. I round the point. 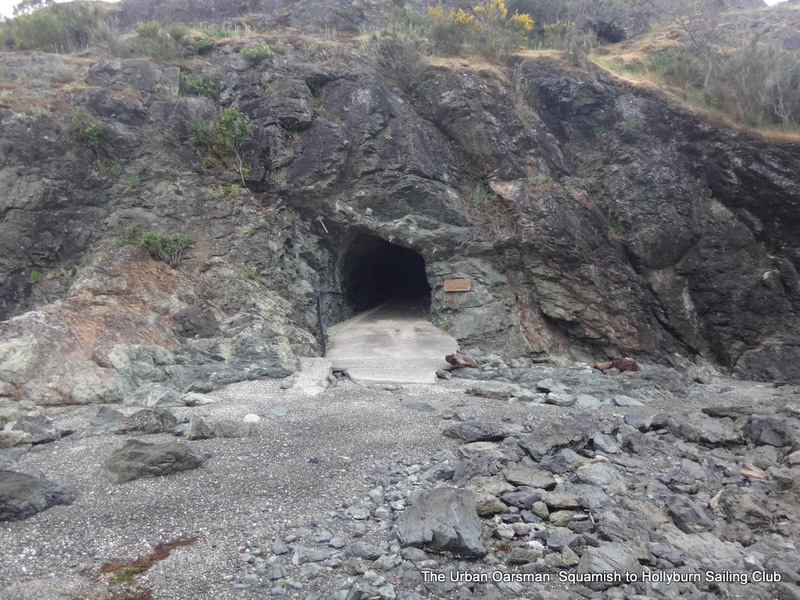 Maciej should be just around the corner, in Starboat Cove. Maciej spots me from the rocks. 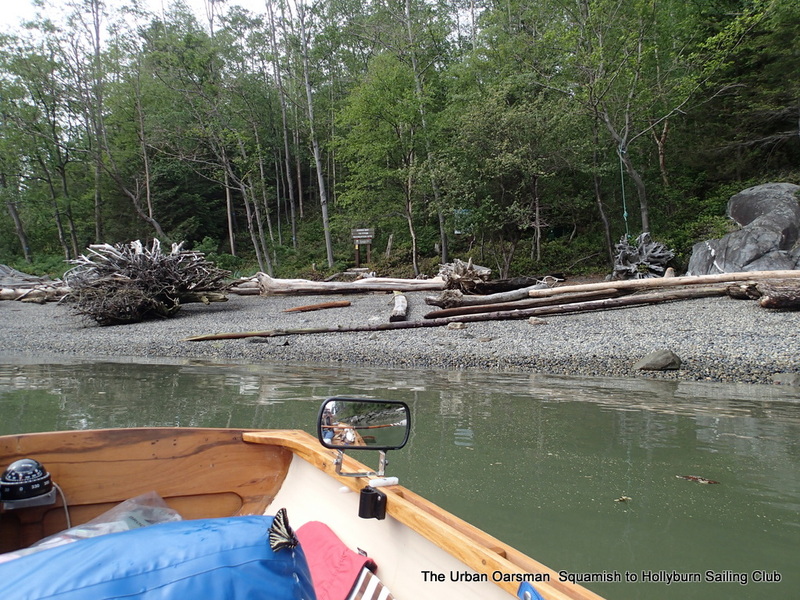 A slight change of plans, Starboat Cove is too full of driftwood for a landing. Rounding Atkinson, the current and wind are now in my favour. I decide to carry on to HSC. Get goin’ while the goin’ is good. Maciej will pack up and catch up to me soon. I am making good time. 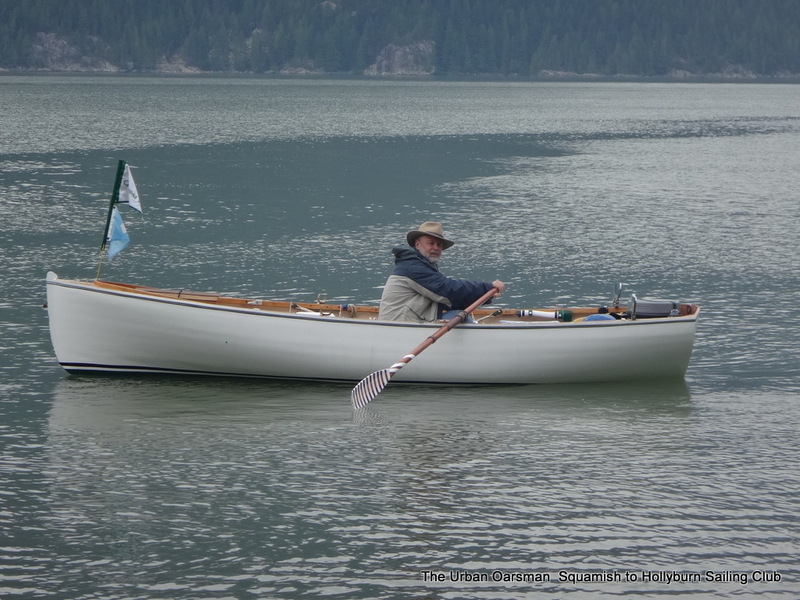 Maciej passes me near anchorage 14. 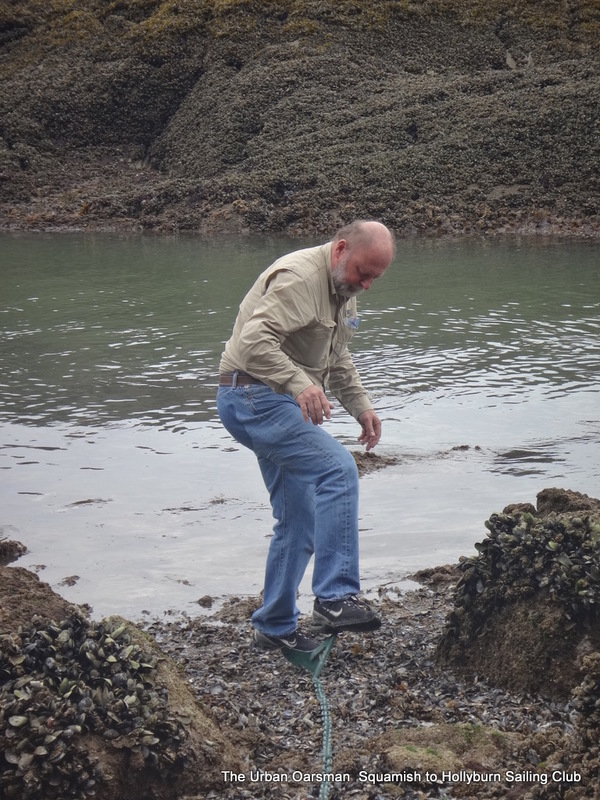 The tide and current continue to favour me. I carry on. Maciej vanishes into the distance. 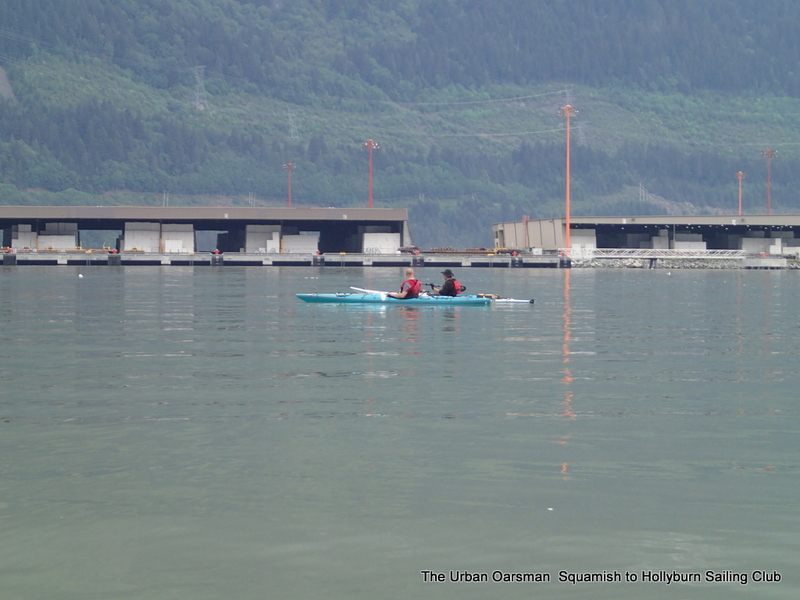 Those kayakers sure are fast. 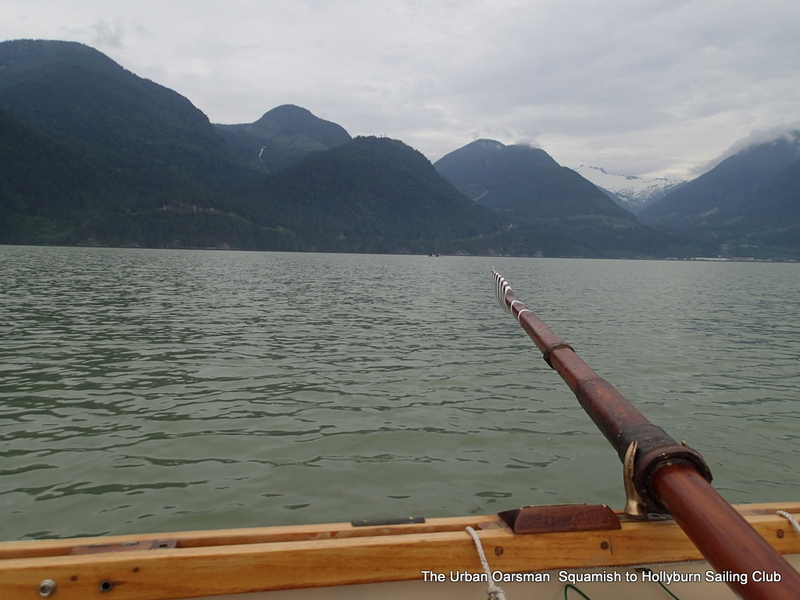 I row on. 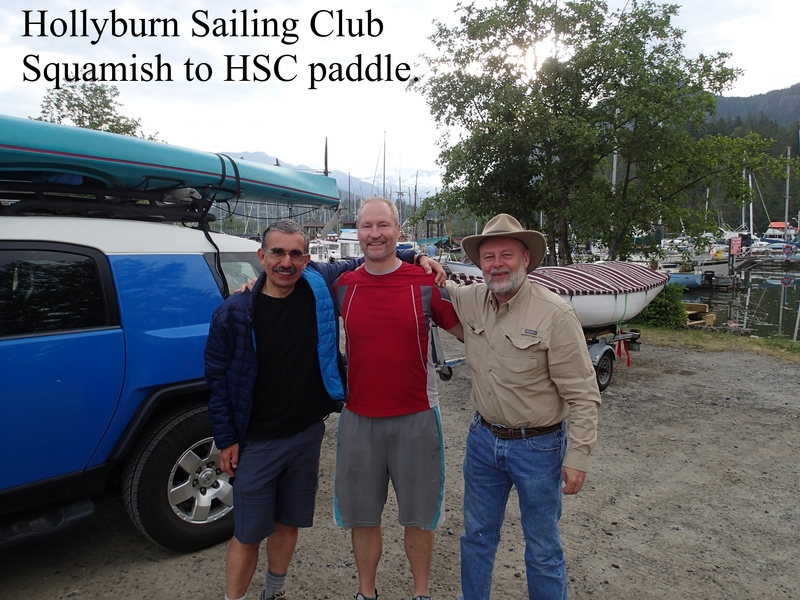 Arriving at Hollyburn Sailing Club. Maciej and I on the beach at HSC. 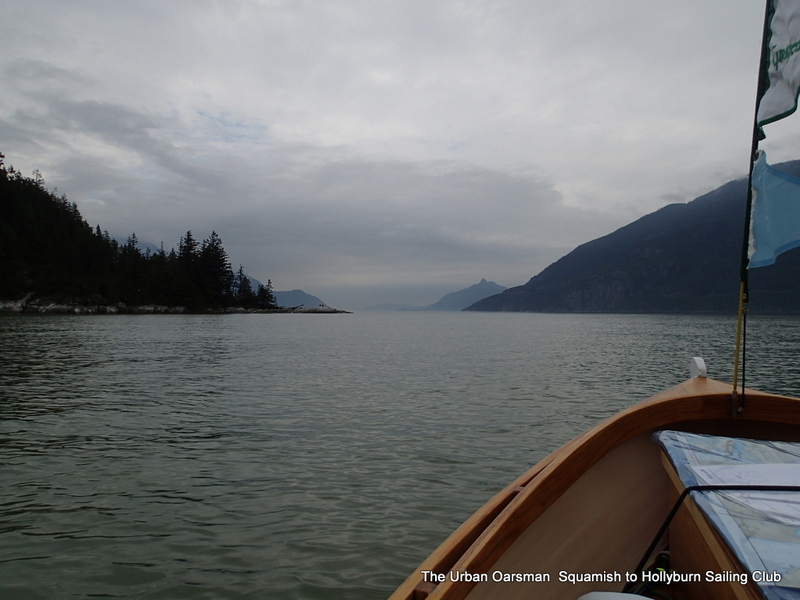 All in all a great row…no blisters and good numbers. Many thing worked well…I can sleep on Gwragedd Annwn. She does row well with a load. 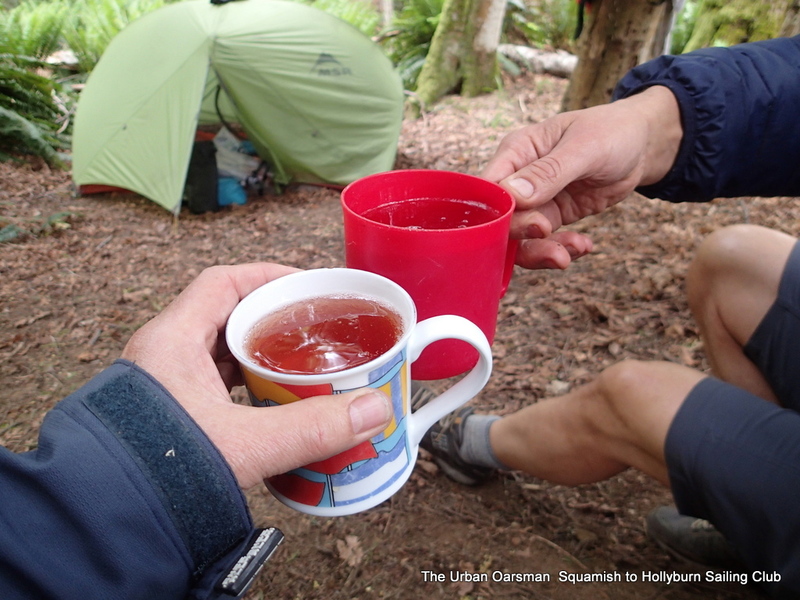 The stove worked, the tent worked, the food storage worked, the equipment storage worked. The anchoring worked. All in all a good row and a good result.